Table: Cast of Characters. Ages on 3rd February 2486. New session: Kirk, Chris, Kevan, Norfolk Road, 18-MAR-16. Game date 26th August 2486. Improve our mass combat system, arriving at the military system, in which we account for the fact that the number of soldiers engaged in a battle is limited by the space available for them to stand and fight. 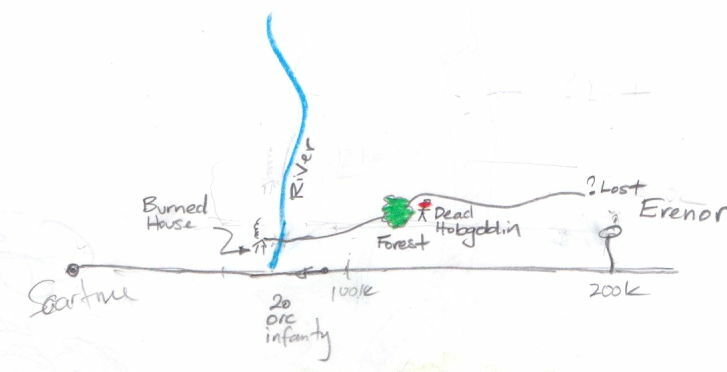 If we assume one meter per soldier, a 10-km front, bounded by two rivers, will accommodate only 10k soliders in line, so it is impossible for an army of 100k to outnumber an army of 20k in the fighting along the front, so long as the front holds. The new system defines the relative prowess of soldier type A with respect to soldier type B as the number of soldiers of type B that a soldier of type A can disable consecutively, one-on-one, before the soldier of type A is himself disabled. The military combat system encourages us to use the hand-to-hand combat system to determine relative prowess. We roll some combats ourselves, for use in the up-coming Neurothi Crusade. Orc infantry with heaviest armor they can carry, ap=12, and longsword versus Neurothi with heaviest armor ap=8 and longsword, both 3rd level, relative strength 1.5 and orc takes 10 rounds to disable the first enemy. Orc with staff and studded leather versus Neurothi with longsword and studded leather, both 3rd level, is 1.5 and takes 9 rounds. (This one we expected to have lower relative prowess because the orc does not have a sword, but that's not how it turned out.) Orc with sword and ap=12 versus Neurothi with longsword and ap=8 by moonlight, both 3rd level, is 3.0 and 27 rounds. In starlight 16.0 and 18 rounds. Establish that the strength of a well-equipped company of soldiers is proportional to the sum of the adventurer levels of its members. This we did with two trials, one of two 3rd level against 1st and 5th, where relative strength of the two 3rds is around 1.1, and another with one 6th level against one 3rd level, where the relative strength of the 6th level is 2.1. On the 25th August, Quayam and Gristel met Camden Beal. They stay the night in the Gumption Arms and the next day, fly back to the Virage Estate in Clavicle. Together with Thristen and Zak, they celebrate Kim's second birthday on the 27th. On 30th August, they depart for Pakesh on wyverns at 7 am, sharing the weight of armor and Zak and Kim between them. The sun is shining. They fly a few hundred meters up and avoid the cool air. They stop for lunch at the Gumption Arms and arrive in Pakesh at 8 pm. Quayam and Gristel settle in at their house, Thristen, Zak and Kim settle in at Thristen's apartment. For the next two weeks, they relax, dance, and socialize. On the 16th September, 2486, the Trans-Outland Highway Authority receives a telegram care of Thristen Alomere from Elivinsikil Mordenixus in Guildencrassen. "All well in G. The Celts are preparing for war. They talk about going south to fight orcs and wizards. Thought just rumor, but now been months of talk. Think real. Could talk with you 9 am Pakesh Time, 18th Sept." Two days later they talk to Elivinsikil and learn that the Neurothi are planning a Crusade into the Western Outlands to liberate the Holy Lands and exterminate the orcs. "What else is going on?" Thristen says, "How is the cheese and beer business?" "Good, for now," Elivinsikil says. "The locals are buying cheese to take with them, and beer. But if they do go, we won't have anyone to sell to." "How many of them are going?" Gristel says, frowning at the trumpet that allows the sound of Elivinsikil's voice to fill the living room of her Pakesh home. "Surely not everyone." "They all say they are going." "Do you have enough food stored for winter?" Quayam says. "We think so," Elivinsikil says. "And we are building a shelter for Thrassus, on the ledge overlooking the town." At the end of the conversation, Quayam, Thristen, and Gristel sit back in their padded chairs and think. This is a fine time of year to be in Pakesh. It's still hot, but not too hot. It's dry, and a warm breeze blows steadily all day, keeping the smell of the city refuse at bay. "I think we had better go and find out what's happing in Neuroth," Quayam says. "This could be serious." Gristel sighs. "I was afraid you would say that." She rubs the small of her back. "I'm happy to come," Thristen says. Gristel shakes her head. "No. You stay here and show Zak a good time. Hang out with Kim. Quayam and I will go." And that what they agree to. On the 20th of September, Quayam and Gristel load their armor and weapons onto their wyverns and fly north at two thousand meters. They stop for lunch in Ankle, and at dusk, they land at the Cliff House, where they are greeted by Romayne and Travis. Here they unload their armor, so that it will be in a convenient place, but they won't be taking it with them on the flight to Guildencrassen. They want to fly faster. Sid is waiting for them at the Cliff House. He is glad to see them. "You're coming with us," Quayam says, scratching the little demon under the chin. "Without your bag of gold. But on the way back, you'll have plenty of gold to sit on." The next morning, the 21st of September, Quayam and Gristel put on their flying armor and load their kit on their wyverns. Sid climbs on to sit in front of Quayam. They bid farewell to their daughter and set off into a clear, still morning. They climb to 3000 m and fly northeast until they see the High Road of Taerin below, following the high ground between the watersheds of the Tarrish and Fen Rivers. The Tarrish River is called the Grototh River in Kent. In Grototh and Neuroth they call it the Tarrish River. Its course defines the border between Neuroth and South Grototh, and between South and North Grototh. The source of the Fen River is the Crystal Lake within the Encircling Mountains, on the plateaux called Gelden. The third major watershed in this region is that of the Chrome River, which is called the Goon River by the sailors on the Whispering Sea, after the goon-fish that swarm up the river in September. Following the course of the High Road, they locate the turning to Erenor's hostel. They land nearby. Gristel stays with the wyverns and Quayam walks into the small town. In the market square are eight wagons, five slaves in pens, half a dozen sapiens guarding the slaves and other merchandise, and fifty hobgoblins trading among themselves and with the sapiens. In the hostel, sixteen sapiens are having soup for lunch. Quayam joins them. He sits next to Ronaldo Wivi, a slave trader native of Kent. Quayam asks Ronaldo if he has heard anything about the Neurothi embarking upon a crusade. "Yes," Ronaldo says, "They are all talking about it." He lowers his voice. "They say they are coming south. All of them. And they are going to wipe out everything in their path. The hobgoblins." He waves a hand. "This place. The land-holders south of here. If they do come, it will be bad for business." When Quayam returns to the wyverns, three hobgoblins are teasing the beasts by making faces and noises. Gristel is standing beside her wyvern and wondering if she should beat up the hobgoblins or not. They seem harmless, just mischievous. Sid is crouched on the back of Quayam's wyvern. Quayam summarizes his conversation with Ronaldo. "Should we talk about it with Erenor?" Gristel says. "Maybe she knows more." "On the way back, maybe. Let's see if we can talk to some Neurothi directly." They fly north and land in Verconix's fortifications. They dismount. Two armed men approach with their helmets under their arms. "What's his wife's name?" Gristel says. Quayam raises the perforated metal locket on his chest and speaks into it. "Thristen, what is Verconix's wife's name?" Thristen's voice emanates from the locket. "Beatrix." "Are you sure?" Gristel says. "Aren't you getting her mixed up with Hlatshwayo's partner Beatrix?" "No," Thristen says, "They are both Beatrix." "Got it," Quayam says. The armed men have arrived. Verconix is away, but Beatrix receives them warmly. She serves them lemonade. Before they can converse, they wait a quarter of an hour for the young druid to arrive, the same one who has acted as translator for them in the past. "Yes," Beatrix says, "We will be going south with Lord Dragut in the spring. We will liberate the holy land in the Encircling Mountains. We will wipe out the hellspawn that invaded our world centuries ago. We have been waiting for this Holy War for many years." She smiles, sipping her drink. "I am grateful that I am alive to take part in it." "You want to kill all the orcs?" Quayam says. The young man has some difficulty translating the word orc. There is a silence. Gristel examines her lemonade. "Where did you get lemons?" "I do not know what world they come from, but they come through the conjunctions to the north of our country. If you follow the road past your town where the dragon lives, you will come to the places of the conjunctions. Verconix and I spent two years on other worlds, fighting wars as mercenaries for the Gods of Olympia." To Gristel, she looks at peace and full of benevolence. "We used to come home through the conjunctions. Those were good times. It's where we fell in love." She finishes her lemonade. "And now we have the Crusade to look forward to." "You won't come home from that," Quayam says. The druid translates. "We don't mean to come back," Beatrix says. She smiles. That night, Quayam and Gristel lie in an ancient four-poster bed made of carved oak. The cloth cover above them catches debris and animal droppings falling from the wood rafters. They are in the Tower Bedroom, the highest room in the Manor House of Guildencrassen. The room is circular and has windows on all sides. The window shutters are open, but the windows themselves are closed. The small glass panes of the windows are held together by lead seams. Through the glass panes, the stars shining in the clear, cold, sky are stretched into lines, or sometimes appear double. A pile of coals glows in the fireplace. Sitting up in the bed, Gristel can feel the heat of the fireplace on her face. The mattress is too soft, and smells musty, but the sheets are clean. "I like this place. It's creepy." She says. "We could try the basement, if you want to get more creepy." "This is more creepy than the basement, I think. Here, the heroine in the horror story can think that she's being treated like a princess, but then, in the middle of the night, the monster of the house creeps out of a hidden door and attacks. She screams, but because she's at the top of the tower, no-one hears her." "Good luck to the monster that attacks you in the middle of the night," Quayam says. Gristel contemplates for a while, and then delivers a cogent and well-paced monolog on the vulnerability of the mind, and the possibility that prescience could be taken away in a sufficiently-terrifying moment of shock, and perhaps that's how assassins do their work. She turns to see what Quayam will say. But he is already asleep. She smiles. The 22nd September is overcast and damp. Quayam and Gristel climb to the rock ledge that overlooks the town, and admire the shelter the town's residents have been building for Thrassus. The frame of the shelter is complete, and most of the roof. It is thirty meters wide, twenty meters deep, and five meters high. It is constructed entirely out of wood, with no supports between the walls. The rear roof is cantilevered into the side of the hill, with logs rising up and bending to take the load of the roof. The walls are vertical beams, and the thirty-meter cross-beams of the roof are tree-trunks. Thrassus lies beneath the shelter, looking out over the town. Should he wish to take flight, he need only crawl out, spread his wings, and jump. "This is a remarkable structure," Gristel says to Thrassus. Quayam is standing back and admiring the view, having asserted that he fully expects Thrassus to be "taciturn in the extreme". "Building and mining are similar disciplines," Thrassus says. "They require that we estimate the weight of our materials, their strength, and the amount by which their natural shapes will be deformed by the task we expect them to perform. It is possible that this structure will collapse upon me if we have a heavy fall of snow. Some of our builders are of the opinion that such a collapse is inevitable. We shall see. If the roof does collapse, I plan to trade some of my gold for iron beams from Luxoden to support the roof." Gristel stares at the roof. It is made of wood, but it must be heavy. She supposes Thrassus must be sturdy enough to survive a collapse. "We are glad to see these people prospering under your guardianship. Thank Thrassus, for what you have done for them." "You are welcome," Thrassus says. Later, Gristel is tending to the wyverns in the Manor Yard. Quayam is watching her out the window of the study. Sid the Demon is sitting on two wyvern-panniers full of gold that lie on the floor beneath the window. Fabio Publius is sitting nearby. Quayam has asserted that he and his colleagues are certain that Fabio can make molecular bridges. Fabio has admitted that he can. Quayam has summarized the conversation he and Thristen had with Richard Crockford about Fabio a few months ago. "I know," Fabio says, "If I make a business out of my molecular bridge, I will be noticed, and kidnapped by an ambitious despot. Or by the Endans. Or maybe the Ursians, even. So I must keep my power secret." He shakes his head. "I worked all my life to learn to do what I do, and it proves to be useless at earning me a living. Surely there must be some way I can use my molecular bridge to make me some money? You have all that gold to carry back to Ursia. How much does it weigh?" "I could gate that to Pakesh for you in one second." Soon after dawn on the 23rd September, Quayam and Gristel load their kit onto their wyverns. The panniers of gold go on Quayam's wyvern, along with Sid the Demon. They bid farewell to Elivinsikil and take off into a clear, warm day with no wind to speak of. They fly east to the nearby village, and land outside the hall of Chief Alerix. They dismount and Alerix emerges from his Hall to greet them. A man of about sixty years, walking with a limp, is by his side. This man speaks Latin. "Greetings," he says, "I am Alerix's uncle. My name is Cornalis. I can act as translator for you." Through Cornalis, they learn that Alerix plans to go on the Holy Crusade, the crusade will begin at the end of winter, and everyone is welcome to come, so long as they pledge obedience to Lord Dragut, leader of the Army of the Holy Crusade. "I have been to Dragut's camp," Alerix said, "And pledged allegiance for myself and my men. We have been waiting for many years for this day to come. You must come with us! It would be a fine thing to fight with you against the spawn of hell." Quayam and Gristel inform Alerix that they have no plans to go on any crusade, but they would like to meet Dragut. "The camp is on a southern bend of the Tarrish River," Cornalis says, "Two days ride by horse." He points to the wyverns. "A little over an hour on one of your wyverns." "Where did you learn to speak Latin?" Gristel says. "When I was a mercenary on Olympia." "Are you going on the crusade?" "No, I will remain here. I am lame. I am no good in battle. I will manage Alerix's estate until he returns. One of my duties will be to make sure your people in Guildencrassen are unmolested. We expect half our people to leave in the spring. Most of the children will remain, and one in five of our fighters Alerix will order to stay." "It's a pleasure to meet you Cornalis," Quayam says, "We look forward to dealing with you." Half an hour after they left Guildencrassen, they take off again and head south for the Tarrish River. They find Dragut's camp an hour later, on the north bank of the river. A stockade surrounds Lord Dragut's tent. Within the stockade are three encampments of roughly a thousand soldiers each. Outside are ten more camps of one or two thousand men each, with hundreds of cavalry horses. There are sappers at work in their own compound, three wyverns in an enclosure, and two dozen griffs in their own enclosure. Across the river, reached by a bridge, is a cleared area where several thousand soldiers are practicing infantry maneuvers. Flying above the camp are two dozen griffs, practicing flying in close formation between one hundred and five hundred meters up. None of them see Quayam and Gristel's wyverns until they drop down from two thousand meters to five hundred meters. Quayam and Gristel steer their mounts in a circuit of the camp to announce their presence. Griffs fly to close with them, but the wyverns are too fast. At the end of their circuit, the wyverns land in the enclosure with the other wyverns and dismount. Hundreds of soldiers approach the wyvern enclosure. Quayam and Gristel exit the gate and announce their desire to meet with Dragut, speaking in Latin. A young soldier answers that he will take them to the gates of the stockade. They follow him. Another soldier asks them their names, and they answer Quayam Srae and Gristel Virage. When they reach the gate, they are met by two soldiers to whom the crowd shows sufficient deference to stand back. One is a huge, muscular man in plate armor with a large-sword at his side. He gives his name as Arthfael. The other is Boedica, a lean, graceful woman in light banded armor with spear and shield. "Welcome, Quayam and Gristel," Arthfael says, in Latin with barely any trace of a Neurothi accent. "What brings you to Dragut's War Camp?" "We represent the Trans Outland Highway Authority," Quayam says, "We operate a road running from Varay to Morden across The Outlands. We wish to speak to Dragut about his Crusade." "Very well," Arthfael says, "Come in." He leads them to a clearing at the center of the stockade, in front of a large tent. In front of the tent is an open space strewn with straw. It is hot and dry today, but in the recent past it has rained, and much of the ground in the camp is soft. Boedica invites them to sit beneath a parasol at a table and they accept. She serves them lemonade while Arthfael walks to the tent. "Dragut is having his bath at the moment," Boedica says. Arthfael returns and takes a seat. "Lord Dragut will see you when he is ready." The sun shines on Arthfael's eyes and he squints and shifts on his chair. His skin is pale, as is Boedica's. Gristel cannot be sure how old they are, which suggests to her that they are both taking longevity drugs. "When you meet him," Boedica says, "He will want to spar with you before you speak. Just a few passes. One of his games is to try to tell your character and history from the way you fight. So don't talk to him until after he says the match is over. He does not want to hear your accent, because that gives a lot away." Arthfael leans on the table. "If Dragut thinks that one of us can capture you and take you prisoner, he'll instruct us to do so. Only one of us. He will then ransom you for money from your loved ones." He smiles. "We are going to war. We need money. But if he thinks you will be able to evade capture, he will talk to you and let you go free." "There enough of you here," Quayam says, "to make our escape difficult. We believed we would be permitted to go free when we entered." "You can go free now," Boedica says. "And it would be only one of us who tries to take you prisoner. No other member of the army will be permitted to assist." Quayam frowns. Gristel examines the faces of the onlookers ten meters away. Arthfael says, "I give you my word. This is Dragut's way. You can both go free now, or you can face the test. In any case, do you think you could escape from me?" Gristel looks at him. "Yes. I'm not sure I could take you in a fight. But I could run away from you." "Well then, you have nothing to worry about," Boedica says. Boedica's Latin is fluent also, but with a strong Neurothi accent. "Did you learn Latin on Olympia?" Gristel says. Boedica laughs. "Women cannot stay on Olympia. They don't want us to have any babies there. When we fight for the Gods, we go straight to the battle. When we come back, we gate to one of the Open Worlds with conjunctions to the north of here. I learned Latin later in life, on my own travels. But I have spent a few hours there." She points at Quayam. "Your people are common in that place. But one is so heavy there, I found it hard to breath." Gristel sips her lemonade. "Can you tell us something about Dragut, and why you have chosen him as your leader?" Over the next few minutes, Quayam and Gristel learn that the Dragut is eighty years old. He has been traveled all over Clarus and many other worlds, as a Neuroth Mercenary, as an adventurer, as a soldier in many wars for any number of causes. He has vanquished hundreds of indomitable monsters, stolen their treasure, and rescued dozens of damsels in distress. He has flown wyverns across uncharted oceans, he has flown with a company of hippogriffs in the Ursian Army. He has been a corsair, a pirate, and a galley slave. A prophesy delivered by the Arch-Druid long ago foretold him leading the greatest army of the age to glory and destruction, and that time has come. At any moment in the past twenty years he could have made himself king of Neuroth, but instead he has satisfied himself with making sure that nobody else becomes king, and that no cruel and unjust leader gains too much power over his countrymen. He might be away for two years, return, kill six chiefs, and leave again. He is regarded as the hero of the nation, and his fate is to lead the nation to glory. A wiry old man in a loincloth, carrying a sword in one hand, pulls back the tent door and walks out into the sunlight. Quayam and Gristel catch a brief glimpse of a plump middle-aged woman and a slender young woman in the dim light inside. Dragut calls out in Neurothi. Arthfael and Boedica stand up and lead Quayam and Gristel to the far side of the fighting arena from the old man. Arthfael introduces Quayam and Gristel. "I want you to fight me," Dragut says in Latin. "One at a time." Gristel draws her sword and steps forward. She is wearing her flying armor. Dragut (named after Turgut Reis) is a fiftieth level fighter-thief on longevity drugs supplied by the Celtic Pantheon. He is himself ready to go out in one last bash. If he can make it last three years, so much the better, but he will stand by his men until his last breath or theirs. In each round of combat, his chance of dying of heart failure is 1% if he fights as fl=50, 0.3% as fl=40, and 0.1% as fl=30. He believes that you don't know someone until you fight them, so he is always willing to go a few rounds with anyone he first meets, always as fl=30, in which state he is barely exerting himself. Gristel goes five rounds with Dragut. She holds her own against him, but he seems to be barely trying, as if he is watching her, but has no real concern about being hit. He has to dodge a few of her blows, but he is content to do so. He backs away. She lowers her sword. Dragut points at her with his free hand. "Gristel Virage. You were trained in Varay. You have a child that you love. You have not learned to control your anger. You are honest. You are not burdened by compassion. Boedica would not be able to take you prisoner." Gristel smiles. "You might be right, Lord Dragut." Quayam steps forward and draws his sword. Dragut moves advances casually and fights in his lazy way for a few rounds, but Quayam is so quick, that Dragut must jump and dodge in a manner that he appears to resent. He steps back, grimaces, grips his sword, and comes at Quayam at full speed. He is as quick as Quayam, and his old wiry body is as strong. His skill surpasses anything that Quayam has experienced before, even that of Falmut Grossman, even that of his grandfather Mikado Srae, with whom Quayam sparred on Eldrich in 2481. Dragut dominates Quayam for two rounds, then backs off, panting. "Quayam Srae. You are a student of Lichtenhauer's school of sword-fighting. You are the husband of that woman." He points to Gristel. "You have a child you love. You are honest. You are often angry, but never when you are fighting. Arthfael would not be able to take you prisoner." "Let's have some lemonade," Dragut says. When they are seated, they exchange small-talk with Dragut, while Arthfael and Boedica stand two meters behind their Lord. When he has finished his lemonade, Dragut says. "What do you want to say to me?" "We have come to try to persuade you of the folly of your crusade," Gristel says. In this endeavor, they fail. Dragut knows that the orcs fight at night. He says he will still beat them, and if he's wrong, well he and his men will die in battle. "If we win, we win, and if we lose, we win," he says. He smiles, revealing perfectly straight teeth. He admits that there will be many children in the army. Gristel asks him to take pity on them, for they will be likely to die also. Dragut says that everyone dies. But not everyone has the opportunity to die in a Holy Crusade. Even a child should be permitted that glory. "Just to make sure we understand you correctly," Quayam says, "You plan to wipe out the orcs, and then go on to wipe out the wizards of Ursia." "That's the plan," Dragut says. "Will you join us?" "No," Quayam says, "But thank you for your invitation. How many men do you expect to lead on this crusade?" "A few hundreds of thousands is my guess," Dragut says. "What are they going to eat?" Gristel says. Dragut laughs. "This is a Holy Crusade. The Gods will provide." Soon after, they bid a polite goodbye to Dragut, and then to Arthfael and Boedica. They mount their wyverns, which have been unmolested, and take off. It is 9:30 am by Gristel's watch. They decide to make for the Green Horn Tavern. On the way, they talk to Thristen through their walkie-talkie bridges, which is hard to do in the rushing air of a wyvern-ride, but with practice, they have figured out how. "I liked Arthfael and Boedica," Gristel says. "I think I even liked Dragut. Gristel out." "He's a dangerous man," Quayam says. "Quayam out." "I wish I could have been there," Thristen says. "Thristen out." New Session: Kirk, Chris, and Kevan, Norfolk Road, 13-MAY-16. Game date 23th September 2486. The Law of Forward Passage for conjunctions stated that it is impossible to travel through conjunctions and arrive back at your starting point at a time earlier than you departed, even if you travel close to the speed of light. If we have two conjunctions connecting the same two planets, and their periods are not identical, there will come a day when they are both open at the same time. Light travels 3,000 km in 10 ms, and 3,000 km is the kind of distance we expect to have to travel to pass through the first conjunction to the second world, cross the second world to the second conjunction, pass through the second conjunction, and cross the first world to arrive back where we started. If the time shifts of the two conjunctions add up to a value greater than 10 ms, the Law of Forward Passage will be violated. As things stand now, each planet is visited by an average of one hundred conjunctions that are open 3% of the time. If we could travel at the speed of light, every planet in the Celest Sector would be connected to every other planet at all times. If the time shifts of conjunctions are greater than 10 ms, we violate the Law of Forward Passage. And yet, in the hand-written diaries of the game, and in the Captive and the Clowns, and in many places in the Essays and Rules, the conjunctions are declared to have time shifts of several days. We agree unanimously that the Law of Forward Passage must take precedence over the existing history, because it is essential to the safety and neutrality of travel by conjunctions. Furthermore, the time shifts are confusing in the extreme, and are complicating our efforts to write a Kambiz Almanac of Conjunctions program. The time shifts preclude a universal calendar for the Celesti Sector, or even for each planet, without an arbitrary system of "Olympian Standard Conjunctions". If we abandon the time shifts, conjunctions will become more practical to manage in the game. Our objective is to bring into the game more consequences of conjunctions: trade, travelers, watchers flying overhead on griffs, weather phenomena caused by air passing through a conjunction, disturbance of the planet's magnetic field, and the ability to travel across the planet easily by use of two-links or three-links. We re-write the discussion in the Captive and the Clowns between Richard and Thristen, and also a conversation between Romayne and Gristel about conjunction time shifts. We change the date of the Kenyan conjunction to the 24th June 2476. 23rd September 2486: Quayam and Gristel land at the Green Horn Tavern for lunch. Falmut is out hunting, so they don't get to talk to him about the up-coming Crusade. They press on to the Cliff House, arriving there in the evening. Thristen, Zak, and Kim are in Pakesh. 24th of September 2486: A sand storm passes south of Pakesh. The sky above is dark with dust at mid-day when Thristen enters the entrance hall of the large house on the outskirts of the city that serves as the headquarters of Opportunities Incorporated, and the living quarters of several of its staff. Quayam, Gristel, and Thristen have been using Op-Inc's services since their trip to Terminus. That adventure was set up by Op-Inc. Terminus had just been struck by an enormous meteor. They rescued Ramadan, a wealthy elf, and received payment from him. These days, TOHA hires Op-Inc to do research, and that's why Thristen is at the Op-Inc offices today. He closes the front door behind him and walks through a curtain. He is greeted by Abba, the company secretary since its founding. "Good morning Mr. Alomere." Abba is standing behind his desk, but his head is no higher than Thristen's tummy. Abba is a midget, with an adult-sized head and a stocky body. "It's getting nasty out there." Thristen is covered with dust. He brushes some off his clothes and wipes his face with the inside of his sleeve. In the conference room, Thristen sits at a large, spirit stone table with Mehdi Jafari, the president of the company (now 32), Haleh Amanpoor the Olympian Agent (now 75), and Malek Parviz the wizard (now 69). Another employee and shareholder of the company is Ali Littlewood, a creative accountant serving a thirty-day term in jail in Weiland for his role in a highly profitable but slightly illegal transfer of property from Clarus to a divine customer earlier this year. Ali was imprudent enough to stay at the Meadow Inn waiting to take the CS1 conjunction back across the continent rather than making straight for a boat or a camel. But these five people are the same group that started Op-Inc almost ten years ago. They have one other person on their payroll, although they are not a shareholder: the god Cesarian, who lives on the planet Glare, but performs illegal gating for Op-Inc when they need it. "What can you tell me about Talismen of Summoning?" Thristen says. Haleh answers his question. "A Talisman of Summoning is a divine artifact. The bearer of a Talisman of Summoning does not need to report her location to Olympia before summoning any creature or commodity. The One Percent of Lifetime Summoning Rule was introduced for Clarus in 1865 at the height of the Dark Ages. The purpose of the rule was to permit sapien armies to summon supplies while fighting the orcs. At the end of the Dark Ages, the rule was left in place, but the temple plots of the Outlands were transferred to the Princes of Hell, who were responsible for limiting the population of hellspawn within the plots. The Talismans of Summoning were distributed in 2000 AE at the time of the Reconciliation Treaty to various sapien rulers and generals. "The sapien armies were keen to continue their war against the orcs until all orcs were exterminated. They argued that the Princes of Hell would betray the spirit of the Reconciliation Treaty and send their orcs on raids into the nations bordering the Outlands. The orcs would be able to raid with impunity because they could withdraw safely into the Outlands afterwards, where the Princes of Hell could forbid summoning be sapien armies. The Talismans of Summoning satisfied the sapiens because they would permit sapien armies to summon without permission of any temple plot holder." "Are the talismans associated with any particular pantheon or summoning agency?" Malek says. "No. They are not themselves summoning bridges. They contain a doublet connected to a special office on Olympia. The talisman office holds the other half of the doublet in the talisman. The bearer of the talisman must perform a ritual in full view of a separate summoning bridge belonging to any summoning agency. The ritual is for formality's sake, and lasts a few minutes. During the ritual, the talisman emits a sequence of colored lights generated by the talisman office, and viewed by them through another bridge from the agency to the office. Thus the talisman office confirms the identity and authenticity of the talisman so that the summoning agency can grant summoning without permission of the temple plot owner at the summoner's location." "How many talismans are there?" Thristen says. "There were six," Haleh say. She looks down at her notes. "They are all different in appearance. The Exshathallion Bowl is a flat-bottomed bowl of iron, with the doublet in the bottom. The use of the talismans is a matter of public record on Olympia. The Exshathallion Bowl was lost in the twenty-first century. It appeared again a few years ago, dug up by some adventurers in Caravel. It was stolen immediately and used by Lakh in an invasion of Caravel in 2483. It is now in the treasury of the Queen of Caravel. "The Ring of Bartholomew was given to a hero of the same name. It is a large ring, which he wore on a chain around his neck. He died in what is now Neuroth, and the ring passed into the hands of the Druids of Neuroth. It has been used frequently since then in rituals, and most recently on 15th September this year." "What do they summon when it is used?" Thristen says. "That information is not public record," Haleh says. "Nor is the name of the person using the talisman. Only the use itself is recorded." "How about the summoning agency used?" Malek says. "That, too, is not recorded." "What about the location?" Mehdi says. "Also not recorded, nor even given by the summoner." Haleh sips her tea. The wind blows outside the shuttered windows. Light comes from several luminous stones above their heads. "The Locket of Arianna is in frequent use. I could not determine its location nor its bearer. The Sphere of Alyosha was taken from its sapien bearer when she was killed in the Outlands in the twenty-second century. It was used occasionally in the centuries that followed, but has not been used in six decades." "That's interesting," Mehdi says. "There may be an opportunity there. These talismans are valuable, I assume?" "Most definitely," Haleh says, "The bearers of the talismen take care not to reveal who they are, I think because they do not want it known that they carry such a treasure with them." Mehdi drums his fingers on the table, his eyes staring intently at nothing. Haleh continues. "The Seal of Lothbok was given to a calipanti champion. In the past few years it has been used occasionally." "Ah," Malek says, "I am reminded of something Cyrus the Red said when we worked with him last year." "What was that?" Thristen says. "He said he could summon anywhere on Clarus at any time. This made it possible for him to capitalize on an opportunity we had formulated." "He may have a talisman," Thristen says. Mehdi laughs. "He might. Which one?" "There is one more," Haleh says, "The Pearl of Immulissimus, also known as the Jewel of Hermione after the princess who used it in in the twenty-third century, was given to a the King of Endromis. It remains a royal heirloom. It existence is public knowledge, and it is well guarded. It is used a few times a year, we assume by agents of the crown on government business." Haleh slides a hand-written piece of paper across the table. The writing is Latin. "Here is a summary for your colleagues. That's all I could discover in a week. Do you want me to keep looking?" "Spend another ten hours on it," Thristen says, "Charge it to TOHA. But this is a lot. Thank you." When Thristen leaves, the sand storm has passed by. Dust covers the street, but the sky is clear and bright. With an amulet of summoning, and sufficient funds, Dragut could feed his army all the way into the heart of the Outlands. Maybe even to Pakesh. Haleh does learn more about the talismans in the week following. She is able to obtain the names of some of the talisman users. The Seal of Lothbok is in the hands of Cyrus the Red. The Locket of Arianna is in the hands of the Brotherhood of Light. The Druid Cantankatus of Neuroth has been using the Ring of Bartholomew. 26th September 2486: Thristen meets with Mohsin Kurd, secretary to Malek Fakheem, the Senator Assigned to Foreign Affairs. Mohsin assures Thristen that they are taking the impending crusade seriously, and have heard of it from several of their agents. Gristel and Quayam leave Sid the demon and their gold from Guildencrassen at the Cliff House and proceed to Gutak City, where they talk to Bolus, Ursian Ambassador, and Gashley, Varayan Ambassador, and Rackhammer about Dragut and his crusade. 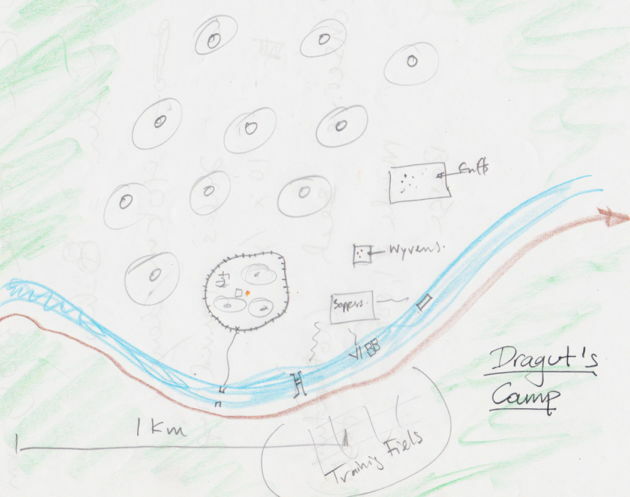 Quayam and Rackhammer spread out a large map and discuss possible courses of the Holy Army. 27th September 2486: Zak, Kim, and Thristen have tea at the residence of Coldiron, the Gutak Ambassador to Ursia, and his wife Cloudmover. Kim plays with some of the ten orc staff and guards that live in the residence. Coldiron is learning Ursian, and is nearly fluent. He tries to hold the conversation in Ursian, but uses occasional latin words. "The Brotherhood of Light in Kent have one of the talismans. They use it when they enter our territory in force for more than a few days. They were using it a great deal, raiding Mokul fifty years ago. Queen Blessedcloud was unable to stop them. Trackandslay seized the throne from her and pursued the Brotherhood as vigorously as he could. He scared them away, I believe, but he never captured the talisman. "There is another one that was lost fifty or a hundred years ago. Rackhammer knows where it us, but has never told me. You'll have to ask him. I think he wanted to acquire it for himself. Certainly it would be a great thing for one of my people to have one: they could summon their precious longevity drugs wherever they wanted." Thristen, Zak, and Kim go to supper the same day with Richard Crockford, Endan Ambassador to Ursia. Zak and Kim play with the youngest of Richard's Children. Thristen and Richard discuss the Crusade. "Kent may enter that war," Richard says, "They have been fighting their Drug War for decades. Wiping out hellspawn would satisfy them. I expect the Brotherhood of Light and many others like them will join in as well. They'll have at least two of these magic things. For the army." "Suppose we took those away from them," Thristen says, "There would be no way they could get to Pakesh without summoning, surely?" They embark upon a discussion of the difficulty of supplying armies. Richard takes notes. After half an hour, Thristen asks him to read what he has so far. "Thirty-five solders each each 1 kg/day of flour. A cart horse eats 15 kg/day of oats. A horse and cart pulls a 500 kg load. With 150 kg of oats and 350 kg of flour, it can go 10 days and supply 35 soldiers. At the end, they eat the horse, which takes them another 3 days. That's 13 days total at 20 km/day their range is 260 km. IF they have 350k soldiers, they need 10k carts." Thristen nods. "Or they can eat the horse sooner." "In which case," Richard says, "They carry more flour, eat the horse, carry the rest of the flour, and they can go maybe seventeen days." They pursue a more general solution to the supply and range problem, and arrive at the following. Where ts is the time for which the army is supplied in days, MH is the load pulled by one horse and cart in kilograms, mS is the mass of flour eaten per day per soldier in kilograms, NS is the number of soldiers in the army, NH is the number of horses, and mH is the mass of oats eaten per horse per day in kilograms. Using the values 500 kg for cart load, one horse per ten soldiers, 1 kg/day flour per soldier, and 15 kg/day oats per horse, the army has 20 days food plus 3 days eating the horse. "In addition," Richard says, "each soldier can carry 20 kg of flour, which is another 20 days. And they might spend twenty days foraging to obtain forty days of food. Now they have 63 days marching and 20 days foraging. Their maximum range is 1200 km." He looks down at his notes. "That's a long way," Thristen says. "Even without the talismans." "Well," Richard says, "it's 1600 km to Pakesh from Neuroth. With any delays of twenty days for battle, they have no chance of reaching Pakesh without the talismans even if they could get water in the desert." "Pakesh is probably safe," Thristen says. "Not if they have the talismans," Richard says. "And they could settle into the Outlands for summer and winter, supply themselves, and move on. Or they could invade Varay." 29th September 2486 Quayam and Gristel depart from the Cliff House, taking Sid and the Guildencrassen gold with them. They stop in Clavicle to deposit the gold in the TOHA bank account. This same day, they arrange for transfer of $800k to Quayam, Gristel, and Thristen to reimburse them for $300k in bribes paid in Scartoni and $500k paid for the Deed of Guildencrassen. The deed is in a safe box at the Clavicle bank. TOHA's bank balance is now $1.98. They fly on to Talili Village to meet with Aries at noon. Headwinds are strong over the hills, and their wyverns must work hard. But they are on time for the meeting. Aries, however, is fifteen minutes late. The conversation with Aries does not go well. Aries offends Quayam in her discussion of divine machinations, in which she does not show sufficient regard for the value of human life. Quayam offends Aries by accusing her of being duplicitous. Aries declares the meeting over and Quayam and Gristel withdraw from the temple. Gristel goes back in to talk to Aries (who is now played by Kirk). Aries says she will wait until Quayam calms down. She does not say "No" to Quayam coming back in to apologize or make peace, but does not agree to it either. Gristel tries to get Aries to be friendly, but Aries is not friendly. They part cordially, but not happily. "Well," Gristel says as they mount their wyverns, "Let's go home. I want to hear some music." They fly to Pakesh, stable their wyverns at their house, check on the staff, have a nap and a bath, round up Thristen, Kim, and Zak, and go to Ghotba's Arn. A group called Sandstorm is playing. The place is crowded and you have to pay extra to sit near the band. But not that much extra. New session: Kirk, Chris, Kevan, Norfolk Road, 25-NOV-16. Game date 30th September 2486. 2nd October 2486: Rackhammer has arrived in Pakesh to stay with his parents, Coldiron and Cloudmover. Coldiron, we recall, is ambassador to Ursia from Gutak. This afternoon, Rackhammer arrives on foot at Quayam and Gristel's house, followed by ten admiring children. They discuss the impending Neurothi Invasion, and the role that Talismans of Summoning might play in supplying the Horde. The next day, at Thristen's apartment with Zak and Kim present, the discussion continues. They conclude that Quayam, Gristel, and Thristen should put their prowess to use in an attempt to acquire any talisman the Neurothi Horde might conceivable capture or make use of in the invasion. The talisman in the hands of Dragut's druid they think to be beyond their skill to obtain, although they will attempt to steal if an opportunity affords itself. Rackhammer reveals that the Sphere of Alyosha belonged to his cousin once removed, Steelthrower, who took it from a sapien warrior he killed in the twenty-second century. Steelthrower used it occasionally in the Outlands. Sixty years ago Steelthrower disappeared near Raven Mountain, on the northern border of Gelden. 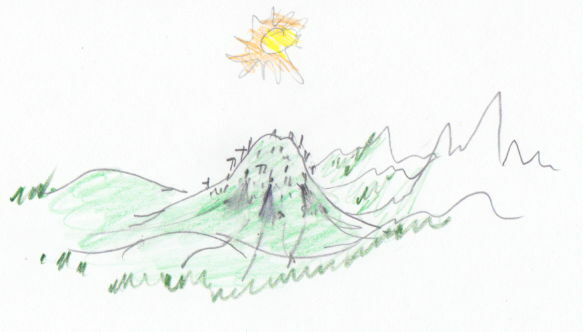 This mountain is the site of a large settlement of goblins who mine the mountain for tin, copper, and gold. "I visited the mountain twenty years ago," Rackhammer said, "seeking to learn the fate of my cousin. I was able to obtain an audience with the goblin king, and about his neck I saw what I believe was The Sphere depending from a gold chain. I had seen it several times in the hands of my cousin. The chain and the setting of the sphere was of goblin manufacture. The sphere itself is roughly five centimeters in diameter, made of cloudy glass with a dark heart to it." Raven Mountain is in the path of the invasion Dragut has described. Rackhammer has kept the secret of The Sphere's location for the past twenty years. He reveals it now after our heroes promise they will give it to him if they are able to capture it. There are two other talismans that concern them: the one in Caravel, the Bowl of Exshathallion, and the one with the Brotherhood of Light in Kent, the Amulet of Arianna. 6th October 2486: Quayam, Gristel, Thristen, Zak, and Kim mount three wyverns and fly from Pakesh to Gutak, stopping at Ankle for lunch. Rackhammer remains in Pakesh for another two days, then joins them in Gutak on the 8th October. In a discussion with Gashley, Bolus, and Rackhammer, our heroes resolve to try first to obtain the Amulet of Arianna, which, if they can get it, they will keep to themselves, and keep secret. We discuss the definition of a Hacker's Inn. It is a place where an adventurer can rest in peace, with no fear of attack. That is to say: if you can get to a Hacker's Inn, you can rest up and get your dodging points back. Most Hacker's Inns are owned by groups of adventurers. The adventurer celebrities who visit the Inns attract a far larger number of other customers, but it is the adventurers themselves who enforce the rule of no conflict between adventurers, and no attacks upon adventurers within the compound of the Inn. This respect for the Hacker's Inn is the closest thing to a shared code of conduct that adventurers have. There is no formal procedure for punishing those that violate the sanctuary of a Hacker's Inn, but each violation will result in a plan for punishment, and that plan will be executed by adventurers capable of tackling the violator. In order to make money, a Hacker Inn must accommodate the most wealthy and accomplished adventurers, not because they contribute a significant amount of revenue themselves, but because the chance of seeing such guests will attract many other rich customers. Hacker Inns always provide a compound of at least one hectare, which includes stables for wyverns, hippogriffs, and horses. The wyvern groom will have to be at least a fifth level adventurer in order to deal with bad-tempered wyverns, and there will be wyverns to look after only a fraction of the time, so the cost of the wyvern housing, if it is to pay for itself, will be around $1000/day. For griffs, $200/day, horses $50/day. A large guest room is $300/day and can be shared by four people. On this date, the TOHA bank balance should be $1.97M according to our latest calculations. We plan to charge all of Quayam, Gristel, and Thristen's expenses to TOHA. Staying at Hacker's Inns with three wyverns, their cost per day is around $4200. If we add the classic adventurer monthly expenses for the three of them together, $1000/month per adventurer level, we get $90k/month = $1M/yr. We will add this to TOHA's operating expenses. From now on, QTG will be responsible for carrying cash, but expenses will be rolled into the $1M. 9th October 2486: Quayam, Gristel, and Thristen mount their wyverns and fly to Scartoni. Sid flies with Quayam. It is a warm Autumn day, 20°C in Gutak, with scattered clouds. Arrive at Taerin's End in the mid-afternoon and stable their mounts. They carry Sid to their room in a sack. Cyrus the Red was there two days ago. "Is that a coincidence?" Gristel says, "Doesn't he have one of the Talismans? He could be selling it to Dragut." "There's not much we can do about that," Thristen says, "But I doubt it's the case." Talk to Haleh of Op-Inc in the afternoon. She has answers to a question. "Do the talismans work on other worlds? Strangely, yes they do. There are many Talismans in the Celesti Sector. Six were issued to Clarus. Dozens exist now. Some have time limits on their operation. But the Claran Six do not." In the evening, they go to the Rose Garden, where they talk to Eldano before dinner. They have a list of questions to ask him, but he does not give them the opportunity, instead suggesting they go eat their dinner. Gristel claims that Thristen and Quayam answering Eldano's polite questions with extensive details about interplanetary politics shows a lack of fearful respect for Eldano, who is used to being the one in control of every conversation at his table. "You don't appreciate the effect that your complete absence of fear for Eldano, his men, or any enemy that he has ever faced, has upon him and people like him. They don't want to hear about the Global Milieu. Even if they did, they won't believe our perspective of the gods and hellspawn and dragons. Without meaning to, you are belittling everything they are proud of in themselves." "I think I understand," Thristen says. "That just makes Eldano small-minded," Quayam says. "He is what he is," Gristel says. "I like him, actually. I'm happy to go back and talk to him after supper." "Let me try again," Thristen says, and he does try again, with better results. Eldano agrees, for one thousand guineas, to get them a map of the Brotherhood of Light compound and its location, and any news about excursions into the Outlands. 10th October 2486: At eight in the morning, talk again to Haleh. "Exciting news: The Amulet of Arianna was used yesterday!" (We rolled 1d30 with a 1/30 chance of the Brotherhood using it the day before, and rolled a one, which changed the trajectory of the adventure.) Although they have no confirmation of where it was used or what was summoned, they are confident that it is being used in the Outlands. At nine in the morning talk to Elivinsikil in Guildencrassen. We note that Elivinsikil is no longer an employee of the Scartoni Police. Thristen delivered her resignation letter when he and his comrades returned to Scartoni with Honorato Publius. They ask her where the lodge of the Brotherhood of Light is to be found in Kent. "It's just north of where the High Road enters the Borderlands, up on a hill. There's a walled compound with windows looking west over the Outlands. You can see the gold-leave spire of their chapel from fifty kilometers away on a clear day. Outside there are paddocks and stables." 10th October, 2486, 10 am: Surface temperature 6°C, westerly wind 20 kph, clouds at 2000 m. They resolve to fly at 1000 m so they can proceed three abreast, separated by 1000 m, one of them over the High Road and the other two flanking, and thus survey a strip of land 4 km wide with sufficient precision to see a horse with rider moving. The temperature at 1000 m is just below freezing. They are wearing their armor rather than their flying kit and they are cold. At 11 am they have flown 100 km along the High Road. Twenty orc infantry are proceeding west along the road. Their shields have the mark of Dag: a white square. At 12 pm they arrive at Erenor's settlement. They are chilled to the bone. They land 200 m from the market square, shown above. To protect their wyverns Quayam erects a gray wall of spirit matter 2.5 m high and 15 m in diameter with no opening, just some footholds for people to climb in and out. The three of them leave their wyverns and Sid in this enclosure and head to Erenor's Hall for something to eat. It is warm and crowded inside. Today's lunch is stew and cider and bread, and it is served for free to Quayam, Gristel, and Thristen, because they are Travelers. Tradesmen must pay $5 for lunch. Erenor summons Thristen to her chamber, where he spends some quality time with her, although he notes that Erenor does not generate as much body heat as Zak, and he is still cold from the morning's ride. Her room is cold because she has not thought to light a fire in the fireplace. She does, however, notice that he is cold, as he lies beside her snow-white body under a thin sheet. "You are shivering," she says, in her voice that is almost, but not quite human. There is a rasp to the vowel sounds, and an echo that seems impossible in the confines of her throat. She gets up and brings blankets from a chest on the wall. She arranges them on Thristen and gets under the sheets again. "I used to be able to make more heat for my lovers, but that part of me is not working very well these days. I should see a doctor, I suppose." "How old are you?" Thristen says. He knows she must be roughly three thousand years old, but he wonders how old she thinks she is. "I don't know," she says. "I can't remember. I have lost all my things. I feel as if I have lived here forever, but I know that's not true." Thristen waits to see if she will say anything more. He is just dropping off to sleep under the blankets when she continues. "I sometimes recognize people who I knew a long time ago. One of my sisters visited me. That was ten years ago. I knew her right away, and she knew me. We remembered our life together, I don't know how long ago. We remembered a tower to tall that it pierced the clouds, and we lived there together in a room with a god named Apollo. None of us could leave the room. But I don't remember why. I remember we were happy." "Yes. I think I am. Every day could bring someone different. I'm happy to see you. Sometimes I think it would be nice to have more excitement. Maybe dancing, and noise and parties. But I don't know where to find those things. There's no place around here like that." Thristen returns to the dining hall half an hour later. Gristel and Quayam are warming themselves by the fire. They talk quietly. Erenor says that Jim the Slaver has a slave captured from a Brotherhood of Light raiding party. He is a handsom boy. She would like to buy him. A young woman sitting near Quayam at lunch says she saw party of knights from the Brotherhood of Light leave Kent several days ago, twelve mounted knights and six pack horses. Thristen talks to Jim the Slaver and a brawny young man chained to a wall. The young man claims to be from the Brotherhood of Light. Outside, they find that the wyverns are circling above, having been harassed by hobgoblins. Call them down, mount up, and fly away at around 1:00 pm. They head west, flying in the same formation, with Thristen in the middle, flying 6 km north of the road. They are within 50 km of Kent when they turn back east again at 2:30 pm, flying farther north. They see a burnt house below at 3:00 pm. Thristen descends and finds the tracks of eleven mounted horses and four unmounted that are two days old. They are 75 km from Kent. Quayam and Gristel descend also, to study the tracks and to get out of the cold wind. The house was burned a few days ago also. It still smells of burned wood. There are no bodies in sight. Whoever lived there must have had time to flee from the knights. "Was this their mission, to burn down houses?" Gristel says. "If so, that's pathetic. If not, why do it?" "We don't know they did it," Quayam says. 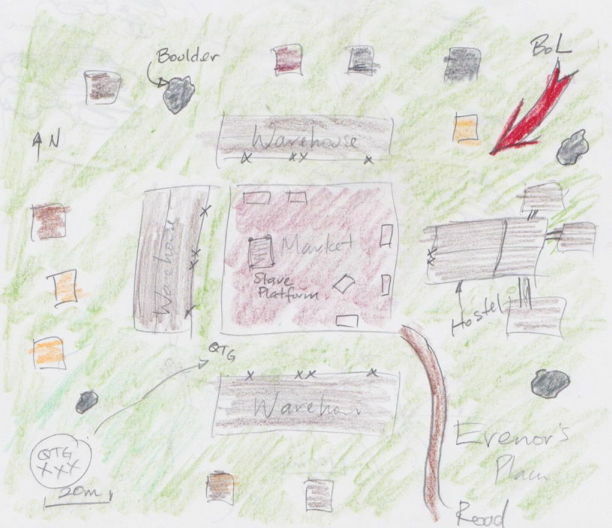 "The trail leads off east," Thristen says, fifty meters away on the path. They mount up and follow the tracks from the air. They are easy enough to see for Thristen: eleven horses going cross-country. The Goblin Moors are for the most part grass, heather, and scrub. They are windy and open and easy to travel across. On the far side of a small forest, there is the corpse of a hobgoblin killed by a sword wound in the past day or two. The trail gets closer to Erenor's settlement, but thrity kilometers north of the settlement, at 5 pm, Thristen loses the trail. It is getting late, and they are cold, so they land outside the settlement in their gray enclosure and Quayam makes a shelter for themselves. 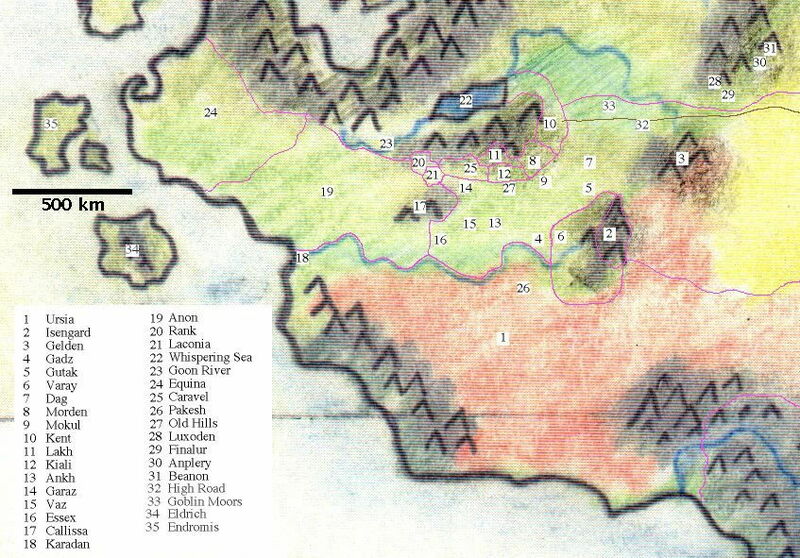 Gristel summons food, giving her location as 30°E, 42°W, with the added detail that they are definitely in the Goblin Moors of the Western Outlands. Her summoning is granted. "We don't appear to be in any need of a Talisman of Summoning out here," Gristel says. "Are we assuming the Brotherhood of Light does need a Talisman to summon." "I think they do," Quayam says. "If I were Lucifer, I would refuse them." "Nevertheless," Gristel says, setting out plates on the conjured wood platform Quayam has fasioned, "we are assuming they used the Talisman out here, rather than in their cozy lodge back in Kent." "We are hoping," Thristen says. They keep watch that night. In the dawn light, Quayam is on watch and he hears the pounding of hooves coming from the north. 11th October, 2486, dawn: The sky is clear. It is 7°C on the ground, but a steady wind of 40 kph is blowing out of the west. Quayam, Gristel, and Thristen slept in their armor, and they now emerg from their shelter, climb over the enclosure wall and run to the market square. Eleven mounted knights charge from the north into the square and draw to a halt. They have with them a horse equipped for battle with no rider and five pack horses. Today is the day of the slave market. The warehouses around the market square are full of slavers and their stock. The leader of the knights stares at Quayam, Gristel, and Thristen, who are forty meters away, but does not appear to recognise them. Some of his men dismount and warn those inside the north warehouse that they must open the door or it will be knocked down. The door does not open. The knights pull a supporting pole from the slave showing platform in the square and use it to batter down the door. It takes several blows, with a big knight pushing from the far end with his armored chest. When the door yields, five knights enter. Jim the slaver stands to one side within the warehouse. A few minutes later, they emerge with five slaves, now freed. Among them is their comrade, who now puts on a suit of armor they brought for him. He is dressed and on his horse in a couple of minutes. The knights go to the western warehouse. They issue the same warning. The door opens. They enter and free seven sapien slaves. There is a scream from inside, as of someone in horror, and a grunt, as of someone in pain. A knight emerges wiping fresh blood from his sword onto a white cloth, laughing and grinning. There is sobbing from inside, and a moment later a hobgoblin woman rushes out of the warehouse and attacks the knight with the bloody sword, scratching at his armor and cursing at him. A second night stabs her from the side with his sword, killing her. He appears to be in a state of extacy as he pulls his sword from the woman's body and holds it up to the light of the rising sun. The leader of the knights dismounts and strikes both of the killers upon their heads with his mailed fist, one after the other. "I ordered you: no killing! I will have you excommunicated for this. Get back on your horses." Quayam steps forward into the square. "Those two stay," he says, pointing to the killers. "The rest of you are free to go." The knights are mounting up. Their leader comes closer on his own horse, which is a magnificent beast, gray with white, and flaring nostrils, with leather armor on chest and neck. The knight himself is in a gorgeous set of plate armor with a large-sword at his waist. "Who are you?" the knight says. "I am Quayam Srae. This is Thriston Allomere, my friend, and Gristel Virage, my wife. Who are you?" "I am Marco Bilanius, Grand Master of the Brotherhood of Light," he stares at them for a few moments. "I know who you are. I know what you did. I know what you have vowed to do." "As I said: those two stay, the rest of you can go." Behind Marco, the other knights have mounted their horses, some with slaves behind them. The back horses are in use as mounts for the slaves also. Marco rides back to the head of his party and orders them to ride. "To the road!" he says, and they urge their horses ahead. The three adventurers draw their bows and shoot at Marco's horse. At one shot per second, they each get eight shots at −20 to hit, range increasing from 20 m to 60 m. That's −4 to −12 for range, +5 for horse size, −5 for cantering away. They shoot Marco's horse dead before he gets forty meters away. He jumps from the poor beast's back and bounds up behind one of his comrades. Quayam is in the sky sixty seconds before Gristel and Thristen, who take a moment to stow their kit. Quayam lands and lays down a barrier of conjured rubber across the road between two rock outcrops, five kilometers from the High Road of Taerin, and in a depression where he is out of sight as he works. The rubber is invisible. Thristen and Gristel fire upon Marco's new horse and then Marco himself. Marco dismounts and the entire party stops. He throws a thunder-egg at Thristen's wyvern, and Thristen must veer to avoid the blast. The knights and slaves have no bows with which to fire back at the wyverns. The Brotherhood of Light believe in hand-to-hand combat, not killing from a distance. The knights and slaves leave the road and make for a wood to the east. The three wyverns swoop in one after the other, shooting. The knights stop and hold up their shields. Quayam casts Targeting Surrounding Sponge and catches six of the knights within the transparent material. But they soon escape by the strength of their horses and their own arms. After another hundred meters, Captain Lance Stumps of the knights throws a thunder-egg and Quayam must swerve to avoid it. The knights and slaves enter the forest. There are sixteen horses left. Quayam, Gristel, and Thristen land their wyverns and, send them up to circle, and charge into the forest after the knights. The knights form a shield wall. Thristen fires twice at the wall. Quayam casts another targeting spong. The knights flee west, farther into the wood. Quayam, Thristen, and Gristel leave the trees, call down their wyverns, and circle the trees. People and horses begin to flee from the forest in singles or pairs, in different places, all heading either west or south. The three wyvern riders try to count how many of each have left, so they will know how many remain in the trees. They count nine mounted knights, one knight with a slave on one horse, three horses being let by a total of ten people running. There are thirteen horses and twenty-one people out of the trees, leaving three horses and three people in the trees. Thristen and Gristel kill all nine horses with single knight riders, swooping down and shooting at no risk to themselves. The others hide in trees. They are all trying to get to the High Road, but they must wait for their chances to run. Meanwhile, two more knights ride out of the forest. One going west, the other east. Quayam pursues one then the other, shooting one dead and wounding the other fatally. So far as they can tell, this leaves one horse and one knight in the forest, but things have been so confusing, they are not certain. Gristel and Thristen enter the forest from opposite sides. They find a horse tethered in the forest. Thristen sees tracks from the horse to an eight-meter high rock wall. Someone climbs the wall. Thristen and Gristel walk around to the top of the wall and there they find a gating frame. Quayam lands and searches the bodies of the two knights who fled last. These are the two killers. Their swords are still wet with blood. He takes a diary off one of them, an acolyte in the order who was longing to make his first kill. He dies as Quayam walks away with the little notebook and joins his comrades in the forest. "That was Marco Bilanius who left by gate," Gristel says, "I did not see him among the knights fleeing the forest." "If he took the amulet with him," Quayam says, "It would be destroyed. It contains a space bridge. So he must have left it here, or given it to one of the other knights." "I doubt he would give it to one of them," Thristen says, "He must have hid it here." But there is no sign of the Amulet of Arianna. They search the ground for hours. Eventually, Thristen climbs the rock face and finds a crevace that has been disturbed. He reaches his hand inside and grasps something metallic. It is the amulet. He descends and they stare at it, a triangle with a glassy gem set in the middle. "That's worth ten million dollars," Gristel says. "We can summon anywhere we like. Anywhere." Quayam says. Back at Erenor's settlement, they inform the succubus that the two killers are dead. They tell Jim the Slaver his slaves are gone and now safe on the High Road. "But there is armor on the two murderers that needs to be stripped and sold," Thristen says. "Follow the tracks. And a horse as well, in the forest." "Thanks," Jim says. "You don't like slavers, do you?" "We don't like slavery," Thristen says. "I don't know if that means we don't like slavers." "It's been a bad day for me," Jim says, "I have a family to feed. But you are a gentleman, and I'll think of you as one." Thristen shakes his hand. At 11:00 am they set off for Scartoni and arrive four hours later for a richley-deserved late lunch in the common room. Thristen has the Amulet in his pocket. "I guess I had better figure out how to use it." New Session: Kirk, Chris, and Kevan, Loring Street, 03-FEB-17. Game date 12th October 2486. Award experience for Amulet of Arianna $10M = 100 kgp = 33 kxp each. Sleep the night at the Taerin's End Hotel. In the morning, go stock up on arrows in Scartoni's arms market. Look for Eldano Kiarelli in the evening but can't find him. Talk to Rackhammer at 10 pm. He describes Raven Mountain, where he believes the Sphere of Alyosha is in the possession of the Goblin King. "The goblins of Raven Mountain are fractious, childish, cunning, and mischievous," he says. "But they are not capricious. They fight when they are angry, but not to steal. They mine the mountain for rare metals and gems, which they deliver directly to their god Erebus in exchange for food. The mountain lies in the foothills of the mountains that encircle Gelden Plateaux, due east from Dag, and south of the High Road of Taerin. If you fly over the mountains and see the Crystal Lake in Gelden, you have gone too far. The mountain itself is easy to identify from the air: it is denuded of trees for a radius of five kilometers. They need wood to smelt ore within the mountain, and to build the burial platforms upon which they lay their dead. When they are smelting ore, there will be smoke emerging from chimneys on the mountainside. There are thousands of ravens flocking about the mountain, feeding upon the corpses on the burial platforms." "We will go there next," Quayam says, "And see if we can obtain the sphere. We already have the Amulet of Arianna. If we obtain the sphere, we will give it to you." 14th October 2486 Find Eldano Kiarelli in the Rose Garden Restaurant. He gives them a fine map of the Brotherhood of Light's lodge near the High Road of Taerin. "A party of knights left a week ago, but they have not yet returned," he tells them, and this they know to be true. They pay him a thousand gold pieces in gems. The next day, they purchase glass gems strung on necklaces of string, small bottles of rum, iron tools of high quality, and other trinkets they hope the goblins will covet sufficiently to trade for the Sphere of Alyosha. In the library of Scartoni, they reassure the librarian that Honorato Publius is well, and they find a book with a picture of the Sphere of Alyosha. They borrow the book and have it photographed. The sphere is a cloudy orb of glass with a black heart. 17th October, 2486 The wind is 7 kph out of the north-west, temperature 11°C with clear skies. They mount their wyverns and fly east at 500 m, leaving at 9 am. At 12 pm they land at Erenor's slave market, where they learn that half of the Brother Hood of Light party, and most of the slaves freed by the knights, have been captured by hobgoblins and are now in shackles as slaves. At 1 pm, they continue East. An hour later, a black orc scout with Dag markings joins them in the air and indicates that they should land. The black orc woman dismounts and approaches them. "I am Cloudwing, wyvern-rider of Dag, answering to King Xanthus. Who are you, and what is your business here?" "We are Quayam Srae, Gristel Virage, and Thristen Alomere," Quayam answers, "Operators of the Trans Outland Highway. We are allies of General Rackhammer of Gutak. Our business we will not discuss with you." "Dag and Gutak are not allies at this time," Cloudwing says, "And you are flying over territory claimed by Dag. Thus I demand that you tell me what your intentions are here, especially in view of your allegiance to Gutak." "We understand your demand," Thristen says, "But we will not discuss our business." "Very well. I shall report as much to the king." Cloudwing returns to her wyvern, and our heroes take off. The black orc follows them, but half an hour later they lose sight of her behind them in the sun as they turn south. They find Raven Mountain at 3:30 pm: a bell-shaped hill a thousand meters high set in cleared land ten kilometers in diameter. They descend through flocks of ravens to the flat-topped summit. The sides and summit of the mountain are so crowded with wooden burial platforms in various states of decay, with skeletons and rotting corpses on many of them, that the wyverns have to circle for a minute before they find a space on the summit large enough to land in. Figure: Raven Mountain Seen from the West In The Morning. Tailings descend from half a dozen entrances encircling the mountain where its diameter is roughly one kilometer. Several goblins, each working alone on a separate platform, observe the wyvern's descent. All of these run off down the mountainside. Our heroes are wearing their flying armor and carrying packs, swords, and bows. They send the wyverns up to circle and wait, with Sid on Quayam's wyvern, and themselves descend the mountain to one of the entrances with mine tailings spread out below. They approach wearing several necklaces of glass beads each. The find the entrance blocked by a double-door made of wood with iron hinges and reinforcing bands. The entrance is one and a half meters high and two meters wide. About eighty centimeters from the ground is an opening in one door, just wide enough for the eyes and mouth of a small goblin to be visible within. The eyes are staring at Quayam, Gristel and Thristen. "Greetings," Thristen says. "We would like to speek to your leader." "You have a funny voice," the small goblin answers. "What are your names?" Thristen cannot tell if the goblin is a girl or a boy, but he is confident it is a child. Thristen gives their names. "And what is your name?" "I am Og, servant of the Great Queen Po." The goblin's dialect of Western Orcish is hard for Quayam and Gristel to understand. "We would like to speak to the great queen," Thristen says. "Why? She's very busy right now." "We are looking for something, and we are willing to pay for it." Thristen unrolls on the ground a canvass sheet and spreads out a selection of pliers, cutters, knives, clamps, taps, screws, and nails. Gristel adds four little bottles of rum. The little goblin squints at the sunlit treasures on the cloth. "What are you looking for?" "A round stone," Thristen says, "In the middle it is dark. It hangs on a chain of metal." "I will speak to the queen," the goblin says, and shuts a hatch on the opening. Our heroes stand in the sunlight. A few minutes later, the hatch opens again. "The great queen will speak to you. When she is ready. Not yet. Soon." "Thank you," Thristen says. After a few minutes waiting he continues, "What is your name?" "Nice to meet you, Og. Is there a king as well as a great queen of your city?" "There once was a king, but his head fell off. Now there is a Great Queen, and she knows her ropes and poles." Quayam and Gristel cannot figure out what the little goblin is saying, but they now see his face pushed aside and in its place that of a larger goblin with an iron tiara on her head. "I am the Queen. What do you want?" She sees the tools. "Bring them closer so I can see them." Thristen and Gristel carry the cloth forward. "What is in the bottles?" Po asks, and they tell her. "What are those sparkling ropes about your necks? Are they magical?" "They are our treasures. We are not here to trade the sparkling ropes. We trade tools and rum for an old, very old, stone, if you have it. The stone is like my two fists together in its shape." Thristen makes a ball out of his two fists, because he cannot know the word for ball in orcish, even though Zak has used it during games of croquet in Gutak. And he cannot remember the word for glass either. "It is made stone that light can shine through, but in the middle it is dark. It has a chain so you can hang it around your neck." The hatch closes. After a minute, it reopens. "We have this thing, but it is very valuable to us." There follows a negotiation, in which Thristen eventually agrees to trade ten tools, one necklace of glass beads, and four bottles of rum for the stone. "Og brings the stone. Pass me the payment," Po says. "Not yet," Thristen says. The goblin smiles, showing fangs and yellow teeth in her dark green face. Her irises are yellow and her pupils are vertical slits. The hatch closes and soon after the other door opens. There are many armed goblins in the tunnel beyond, crowded together behind Po and Og. Og advances to the cloth with a wood box and a milky-white piece of rock, roughly in the shape of an orb, with a dark heart, tied with string to a chain of bronze links. He places the orb and chain on the ground and gathers up the tools and rum and necklace and puts them in the box. His fingers move quickly. His green skin is covered with small lumps that look a bit like warts, but Thristen does not think them to be a disease. Og withdraws with his box and the door closes. "Come back any time," Po says through the hatch. Thristen and Gristel hand the orb back and forth between them. "It's so crude-looking," Gristel says, "Is it glass or quartz?" She holds it up to the sun. "It's supposed to be glass." "It's not the real sphere," Quayam says. "They just made that for us." They call down their wyverns and fly to a nearby hill where Thristen contacts the Druidic pantheon and has them look up the ritual of the Sphere of Alyosha. He performs the ritual, asking to summon sheep without betraying their location. The ritual fails. The sphere does not glow with its own light. They give their location and obtain permission from Erebus's pantheon to summon sheep for their wyverns. At 6:30 pm the sun is setting in the west. A wyvern in silhouette flies into the red light on the horizon. Gristel sighs. "That's what's her name. Well, we could have told her we were looking to be cheated by goblins." "They gave us a stone that fitted the description," Thristen said. Quayam makes a shelter. Gristel arranges objects of increasing hardness. She has the bronze chain which is hardness 3, a steel knife is 5, glass 5.5, steel file 6.5, adamantine 7, diamond 10. Only the diamond will scratch the orb. "It's quartz," Gristel says. 18th October 2486 They keep watch overnight but they are unmolested. The sun rises on scattered clouds with a westerly wind of 7 kph and 19°C. After breakfast, fly to Raven Mountain. The ravens are all over the place, and rise up in a great flock when the wyverns descend. One goblin working on a platform does not run away, so they approaching him. "Greetings," Thristen says, "What a fine platform you have built." The platform has a latter leading up, and is perched on a boulder, with half the platform jutting out as a cantilever. "I'll get a fine view from up here once the ravens have plucked my eyes out," the goblin says. "The platform is for you?" The goblin cuts through a piece of rope with a knife and sits down at the top of the ladder. "Course it's for me. Why else would I be out here in the bloody sunlight putting the thing together? Reckon I have a few more days left before I drop, but not much more." "How do you know you are going to die?" "Har har! I knows because everything dies. As my dad told me before he choked on a rat bone: get your platform done good or you'll be spending the rest of eternity lying on the dirt being eaten by worms." "I guess you don't want to be eaten by worms," Thristen says. "It's all a man can ask for, really," the goblin says. "Anyway, what are you pale-faces doing up here. This is a holy place, you know, we don't really want you stomping around up here disturbing our ghosts." "We want to meet the king of the mountain. The chief of chiefs. Whoever is the boss." "Well, I suppose I could answer questions, but you'll have to pay me." Thristen tosses him a piece of silver, which lands on the ground. The goblin finds it, inspects it, and swallows it. "Right you are then: King Ogilop thinks he's the boss. I could tell you where to find him. But you'll have to pay me for that too." Thristen tosses him another piece of silver, and another to pay for an introduction to the king. The goblin swallows both pieces. "This way," he says. They follow him to an entrance they have labeled Number Three on their map. The opening is three meters wide and two meters high. Double-doors stand open. There are no guards visible. "We'll wait here," Thristen says. "I'll go in and find him. What do you want to see him for, anyway?" Thristen describes the stone they wish to find. The goblin enters the passage. Occasionally, a waft of air emerges from the tunnel, carrying with it a powerful smell of garbage. Their goblin friend emerges. "King Ogilop asks that you come in." Thristen declines. Their goblin friend goes back inside, returns to ask them again, and then two goblins with trumpets made of horn come to the entrance. They blow their horns, making a discordant and comic sound. "Come inside and meet King Ogilop!" one of them says, "He awaits you in his chamber of awaiting." "No thank you," Thristen says. "We'll wait here." The horn-blowers return again a few minutes later to invite them again, but again they decline. Their goblin friend emerges, bleeding from the lip and bruised on his face. "He didn't like that you would not come down. Thought it was my fault." He scurries off around the mountain. An ancient goblin emerges, leaning on a walking stick. His face is like a wrinkled mass. Thristen has never seen an ancient member of any hellspawn species. They all die before they start to look old. "The king will meet you at sunset, here, when the light is not so bright." To this they agree. As they withdraw, their friend the goblin returns with a lump of translucent rock in the approximate shape of a sphere. "I found it!" he says. They take the rock and give him another silver piece. Our heroes return to Entrance Number Three at 6:30 pm. The sun sets and a crescent moon hovers on the western horizon. Clouds are advancing from the east. Their wyverns are circling above as they walk down to the entrance. There are hundreds of goblins on the mountainside. As it gets darker, more of them arrive. They must be using the other exits from the city, because the exit before them is closed. Our heroes are wearing their full armor and their night vision goggles. Quayam makes three transparent, conjured wood shields. When it is quite dark, the mountain doors open and there is a blast of discordant horns. The king emerges on a throne supported on a platform carried by ten goblins. Around him are twenty armed guards walking nearly in step with one another. Their armor is made of iron and they carry spears, shields, and crossbows. With them comes a single lantern on a two-meter pole. "Let us see what you have to offer. Tools, jewels, and rum I am expecting. So I learn from the foolish woman you traded with yesterday." In the light of the lantern he holds up a sphere of milky stone on a brass chain. "This is what you want. But you will have to pay a lot for it. A lot more than you paid Po." A goblin in a robe comes forward with the lantern and inspects what Thristen lays out on a sheet. Thristen keeps adding tools and rum and necklaces, getting more and more reluctant, until Gristel and Quayam say, "No, no more, that's enough." Eventually, the inspector calls out, "It is as you wished, your great majesty. Many tools of high quality." "You, big man," the king says to Thristen, "Take off all your clothes and come and get the stone from me. All of them. Yes, all." Thristen strips naked and approaches the king, the lantern at his back. The goblins, and there must be thousands of them watching from the mountain-side all around in the darkness, shout and stomp. The women are screaming. The men are laughing. Thristen advances among the goblins, whose shoulders are at his waist. He can smell them, their musky sweat combined with a good hint of dried urine and feces. The king is fat and oily. He holds out an orb on a chain. Thristen takes it and returns to his comrades. The goblins have already collected their payment. The king spends a few minutes looking at the tools and making sure they are stored in a box on his litter. This gives Thristen time to put his armor on. The king says, "I have changed my mind. I want the orb back again. Or you should pay me more, all your swords and armor. Or we will fight you and take them from you if you like that better. I am the king, so do what I say." The goblins shout and yell. They disapprove of the king's statement, calling him "word-breaker" and "wind-breaker" and "poop-maker". "Fight us," Thristen says, when the shouting has quieted. Twenty armed goblins advance and attack. Our heroes let go of their conjured shields and remove their goggles. They begin by fighting in triangle back to back, then break out to fight individually surrounded by five goblins each. They fight without drawing their swords, with their fists and feet only. The goblins are armed with spears or swords. The fight takes place in the light of the lantern, which shines over the goblin's heads. The fight goes on for one and a half minutes (twenty-one combat rounds), during which the cheering, betting and whooping from the assembled goblins is so loud as to drown out the sound of the battle itself. At the end, the goblins withdraw when fourteen of their number has been knocked out. So far as our heroes can tell, they have neither killed nor maimed anyone. The king withdraws into the mountain without comment, but the crowd jeers at him. The lantern goes with him. The unconscious soldiers remain on the ground. Our heroes put their goggles on and walk away. A few stones are thrown at them from the crowd. Quayam sponges some of the crowd with dark sponge that causes sufficient confusion and fear that the stones stop. They descend the mountain. When they come to a clear space, they call down their wyverns and fly back to their camp. Once more, they try the ritual of the Sphere of Alyosha, and this time it works. The sphere shines with its own light, changing colors of the rainbow, and Thristen is granted summoning without permission of the temple plot owner. He summons a single glass of water and drinks it. Sid watches from Quayam's lap. "Can we do this on any planet?" Gristel asks. After some discussion with the Druidic Pantheon, their conclusion is that, in spirit, there are no restrictions, but in practice, there are Olympian rules that take precedence over the rules of the Talisman. They will not be permitted to summon orcs to an open world, for example, although they could in principle do so if they refrained from informing the Olympians that they were summoning to an open world. But they can rely upon being able to summon food, horses, griffs, and wyverns, wherever they are, even when they are forbidden by local planetary rules. The same holds for both the Talisman of Arianna and the Sphere of Alyosha. New session: Kirk, Chris, Kevan, Quinton, Loring Street, 29th April 17. Game date 10 pm, Friday 18th October 2486. Our heroes are sitting in a gray conjured shelter on the hill near Raven Mountain, admiring the Sphere of Alyosha, and wondering if they should try the Summoning Ritual on the Talisman of Arianna. It is black night outside, and raining steadily. The three wyverns lie under a roof of green conjured matter that Quayam has erected with the help of two trees. The wyverns have eaten a sheep's worth of cut-up meat, and are curled up togethether to digest their meal. So long as they can stay warm, Wyvern's won't sleep. They will merely rest with their eyes open. If they cannot stay warm, they will allow their bodies to cool down, and then they will become dormant, from which state they can be roused only by vigorous encouragement from their masters. According to Thristen's thermometer, it is 4°C outside. With a belly full of food, the roof above them, and the three of them to share warmth, the wyverns will have no trouble staying warm tonight. Inside the shelter, our heroes have a fire of gathered wood burning, with the smoke leaving out of a chimney. Sid sits right next to the fire, getting too hot to touch, and watching the flames. The shelter is gray, with Thristen's cape as a door, so the fire is not visible from outside. Gristel summons food from Three Aces. They consider using the Sphere of Alyosha to permit them to summon pure water, but decide against the idea. A half-meter molecular bridge to Olympia opens in Gristel's gating frame, and an elf passes them their food. And so they set about their summoned meal: a roasted lamb shoulder, mashed yams, and a cheese and rice risotto with a bottle of dark red wine and a flask of apple juice. They eat off wood platters, drink out of wood goblets, and pick up their food with wood forks and spoons. Steel knives they provide themselves. The wooden accessories have sat for a year upon a shelf on Olympia before this, out of respect for the One Percent of Lifetime rule. Gristel's account will be charged $1800 for the meal, broken down as follows: $1000 for tuning a half-meter diameter molecular bridge, $200 each for three Gormet Adventure Meals, and $200 for a Ten-Year Old Rebok Red Wine, awarded four out of five stars by the Three Aces sommelier. Quayam chews a mouthful of roast lamb and closes his eyes in appreciation. Gristel inhales the aroma of the wine in her goblet. "Is it me, or is the food getting better?" "It's always been good from Three Aces," Thristen says. "But this is some of the best food we ever get to eat," Gristel says, "When we are out in the wilds, we get these incredible meals." "I should hope so for the money they cost," Thristen says. "It's worth every cent," Quayam says. "Hungry after a day outside, hot food on a plate, just like that. It's fantastic." They eat in silence until Thristen stops chewing and frowns. "When I tried to use the fake Sphere of Alyosha, I performed the ritual. We didn't have the real sphere. King Ogilop had it." He stares at Gristel, who stares back. "The real sphere would have glowed," she says. Quayam sits up and points at Thristen. "That's why he gave it to us. It started flashing all different colors and he wanted to get rid of it." "That could be," Gristel says. "I think he still would have sold it to us." "Really?" Quayam says, "The mark of his office, sold for a handful of tools and beads?" "I never wanted to give up the beads," Thristen says, "you two both conceded way to quickly during that negotiation." After supper, Quayam consults his pocket-edition of Kambiz's Almanac of Conjunctions. "A conjunction to an open world opens in the north of Neuroth on the sixth of November," he says, "That's how Vespian Parlay will get back to Clarus." Gristel sets her platter on top of Thristen's. "Suppose we make a copy of the Talisman of Arianna and put it in Vespian's hiding place in the Goblin Moors." This idea they discuss with delight until they conclude that, in practice, it will mean, in Gristel's words, "We are farting about it the freezing cold waiting for him to show up so we can ambush him, or we leave him a fake one and he finds out it's fake as soon as he performs the ritual." "Furthermore," Quayam says, "When he knows he has a fake one, he knows we made the fake one, and thus he knows that we found it. Otherwise he might merely think that he forgot where it was, or that some un-knowing hobgoblin found it and has it hidden in his house." "If we don't want him to know we found it and know how to use it," Thristen says, "We should not use it. We should not try to use it." "We still don't know for sure that we can use it," Gristel says, "Shouldn't we try it once to be sure?" "No," Thristen says, "We don't need to use it. We're going to give the Sphere to Rack, and I'm glad we're sure it's genuine. But the Talisman we can try out later, when we are done with this Crusade, and we think it might be useful when we go on an inter-planetary trip." "Then we should store it somewhere safe," Quayam says. "Let's take it to Packesh and put it in a bank vault," Gristel says. To this proposal they agree: first stop Gutak, next stop Pakesh. The next day, however, it rains steadily. They go out and gather more wood. Thristen looks for signs of spies around the camp, but finds none. They feed the wyverns again, to keep them warm and vigilant. They dry off in the shelter, talk to friends, and relax. An hour after noon, they talk to Rackhammer. He is in Garaz talking to Scholastican and Carnus about the impending Crusade. He will be back in Gutak in a few days. That night, the sky clears and a crescent moon sets an hour before midnight. It cools to freezing. They wyverns show no signs of affection for one another, but their bodies are pressed against one another. Two hours before dawn, Gristel puts her hand on the smooth scales of Stanley's side. His skin is cold, almost freezing. But his breath is still warm, and his eyes are open. She hugs his head and whispers in his ear. He pulls her close with the strength of his neck. She remains nestled against his side for half an hour, looking out across the hilltop, her luminous stone covered. She does not attempt to hug the other two wyverns. They would object. But they respect her enough to let her touch them and check that they are awake. In the light of her luminous stone, they raise their heads and stare down at her along the length of their black snouts. She goes back inside. Thristen stirs and looks up at her, then rolls over goes back to sleep. She crouches by the fire and places more wood upon the coals. On the morning of 20th October, 2486, there is frost on the ground. The sun is shining between scattered clouds. The wind is 22 kph out of the north-west. The temperature at ground level is 5°C. Quayam, Gristel, and Thristen mount their wyverns and take off at 8 am. They circle for height above the hill and set off to the west at an altitude of five hundred meters above the valleys. The hill is left deserted. Inside the gray conjured shelter there is ash in the fireplace and fifteen wooden platters on the floor with a collection of mugs and wooden cutlery. Wind blows through the doorway and out the chimney. Autumn leaves swhirl inside. The conjured matter of the hearth cracked and deformed from the heat of the fire. A kobold in a tree fifty meters away peers through the foliage at the hilltop. "Are they really gone?" he wonders. The black shapes of the wyverns are far in the west now, and look like birds. Better wait a while longer, just to be safe, he's been here two days, no need to hurry. Not unless there's someone else hiding in another tree, in which case… He climbs out of the tree and scrambles up the hill. 20th October 2486 Quayam, Gristel, and Thristen fly west from Raven Mountain, a few hundred meters above the ground, to stay out of the colder air above. Gristel vows to purchase hot stones to insert into her flying kit for the coming winter as soon as they return to Pakesh. They have been underway for only ten minutes when they are attacked by ten black orcs on wyverns, diving on them from out of the sun behind them. The diving wyverns are travelling at 50 m/s. The three cruising wyverns are traveling at 25 m/s. The diving wyverns pass close by. The black orcs throw javelins, not at Quayam, Gristel, and Thristen, but at their three wyverns. The three wyverns turn just enough left and right to avoid the hurled missiles, and the diving wyverns flash past, rise up ahead, turn, and dive down from behind again. Now Quayam, Gristel, and Thristen allow their speed to carry them up, turn, and engage with bows. The black orcs answer with bows, and within seconds a chaotic aerial engavement begins, with the ten attacking wyverns chasing the three adventurers about the sky, firing upon them and taking shots in return. Openly-displayed on the flying armor of the attackers is the white square of Dag. Among the attackers, Gristel glimpses a woman she belives to be Cloudwing. The leader of the black orcs is also obvious: his armor has gold paint around the red square. He is masterful in his handling of his wyvern, he attacks quickly, and he fires his massive just as well when sitting upright as when upside-down. To govern this combat, we devise the following system. The fight is divided into rounds, as always, but the rounds will be ten seconds each. In each round Quayam, Gristel, and Thristen each exchange fire with one and only one enemy. We dismiss the possibility of two black orcs firing upon one target in one round as unlikely because all wyverns are moving so fast, turning so quickly and erratically, that two allies firing at the same target is not only difficult to arrange, but will carry an unacceptable risk of collision or hitting the wrong wyvern. We pick a nominal range for the exchange of fire at 25 m/s, and this value is 30 m. We compare the rider level of the two combatants, and adjust the range according to the difference. If one rider has rider level ten higher than the other, her range is 20 m and the other's range is 40 m when the shots are fired. We account for faster flight due to a lighter load in the following way: for each 1 m/s faster one rider flies than the other, her range is reduced by one and the other's range is increased by one. The riders have the option to fire multiple shots during the exchange, and Quayam, Gristel, and Thristen choose to do so most of the time. For example, when Quayam (figher level 32, rider level 15, 25 m/s, medium bow) exchanges fire with Tyrannusbone of Dag (figher level 15, rider level 15, 25 m/s, heavy bow), Quayam's to-hit roll is 1 − 32 (fl) + 15 (firing from wyvern-back) − 10 (enemy wyvern is a large target) + 6 (five extents to 30 m) + 20 (four shots in one round) = 0. Tyrannusbone's to-hit roll is 1 − 15 (fl) + 15 − 10 + 5 (five extents to 30 m) + 10 (two shots in one round) = 6. All combatants fire at the enemy wyverns. Each time the rider must dodge a shot on behalf of his wyvern, he loses two dodging points, not just one. Furthermore, the wyverns are a far bigger target than a rider, and it's hard to hit anything in the air. When an enemy flies past Quayam, and he fires four arrows, every one of them will hit the wyvern. When he uses +5 arrows with his +5 bow, almost every shot will penetrate the wyvern's six-point armor, and so almost every one of his shots must be dodged. His adversaries are jinking continuously, a combination of yawing, skidding, slipping, and pitch-ups to get out of the way of fire, while at the same time they must look for an opportunity to fire back. One by one, however, the black orcs withdraw from the battle and circle about it, climbing for height. They do not allow themselves to be shot out of the sky and killed. By some means, those who withdraw know that they are risking themselves if they fight on, and their leader, who continues his efforts unabated, pays no head to those who have withdrawn, and gives no orders for them to re-enter the fight. Quayam, Gristel, and Thristen entered the fight with forty arrows each. By round twenty, they have only a few arrows left. They have climbed twenty-eight meters. If they had more arrows, they believe they could finish the fight in their favor. There are only four of their enemies still engaged. Without arrows, however, they are defenceless. They dive away to the west. The four remaining attackers pursue. Gristel takes the lead, so that she is at greatest range from the attackers, because she has notified her companions by walkie-talkie that she is exhausted. Quayam and Thristen fire backwards over their shoulders, and are fired upon from behind. Their last arrows drive two more enemies form the fight, and only two are left to press on. With each second, however, Quayam, Gristel, and Thristen pull away by one meter, for their cruising speed is 26 m/s compared to the two male black orcs at 25 m/s. The other Dag air force wyverns fall in behind their leader. Cloudwing is among them, and Gristel reckons she could catch up to them, but she does not. Thristen know why: he almost shot her out of the sky. He saw the look of horror on her face when three of his four arrows passed within meters of her wyvern the last time she engaged. She will not fight again today. And so it is that our heroes escape from the Dag air force ambush. It is 8:15 am. The battle lasted only five minutes. Their wyverns are injured and bleeding, but they can still fly. The adventurers themselves are unwilling to risk further engagement. (TQG down to 12, 17, and 2 dp respectively, wyverns down to 10, 6, and 3 hp.) An hour later, the Dag riders are still pursuing. They are 3.6 km behind. If our heroes were to land, their enemies would be upon them in a few minutes. So they fly on. They cross the Gelden River. At 10:15 am, Quayam can still see the ten wyverns seven kilometers away, still in pursuit. A few minutes later, he sees them turning to the north. "They have given it up!" he says. "Shall we land?" His voice rises out of Thristen's walkie-talkie bridge. "No, let's not stop unless we have to. It's another four hours to Gutak. We can make it." "Can't we just stop and camp?" Gristel says, "Stanley is bleeing all over." "Not unless we have to," Thristen says, "We could run into anything out here. Those ten could turn south and surprise us. We can't stay out here in this shape. Not unless we have to." Gristel nods. Thristen is right. She is cold and sore and anxious. She pats Stanley's neck and shouts above the wind. "Good boy Stanley! A week's rest and roast meat for you every day. Keep going!" 20th October 2486 Despite the damage they have taken, the wyverns keep flying. Their blood clots. Their strength remains undiminished. They fly on with steady beats of their mighty wings. An hour out of Gutak they are joined by Steelquencher on his wyvern and he escorts them to the Royal Court, where they land, take care of their wyverns, and eventually retire to the residence of the Varayan Ambassador. For a week, they relax with Zak, little Kim, Dominican, Gashley, and their old friend Bolus. Travis and Romayne join them for several days and nights. We award 33 kxp to QTG each for the Sphere of Alyosha, which we deem to be worth at least $10M. The Talisman of Arianna they add to the assets of the Trans-Outland Highway. Rackhammer returns from Garaz on the 26th October. They spend an hour with him the next day. He is in good spirits, but the news he brings is bad. They walk with him among the trees of one of the palace gardens. It is a cold, clear day and leaves crunch beneath their feet. "I failed to convince them of the imminent and shared danger of the up-coming crusade," Rackhammer says, in his deep, slow, and sonorous voic. "Scholastican believes the crusade might crush us, if we are weak, but it will never reach him in Garaz. Carnus believes they can hold their borders against a million sapien soldiers if necessary. Daybreak is holding a Council of Alliances tomorrow in the Hall of Congregations, as I am sure you know. You three I hope will attend and speak freely. All nations who have a stake in the conflict to come are invited to represent themselves. Bolus will speak for Ursia and Gashley for Varay." "We will be there," Quayam says. "Thristen has something for you." Rackhammer's eyes gleam. "You went to Raven Mountain?" "We did," Thristen says, and hands him the Sphere of Alyosha. Rackhammer handles it tenderly and stares into the depths of the milky quartz. "It is as I remember it." He looks up. "Did you enjoy the goblins?" "Yes," Thristen says. "Very much." "I heard you ran into the Dag air force." "We did," Gristel says, "And they almost shot us to pieces. We ran out of arrows." "But you bested them all the same," Rackhammer says. "King Xanthus, I hear, is… dissapointed." "Nobody was killed," Thristen says, "He should be thankful for that." "Is he disappointed in his riders," Gristel says, "or disappointed that he did not bring us down and take all our stuff?" "The latter, I think," Rackhammer says. "He did his best, I'm sure." "He led the attack," Rackhammer says, "Did you not recognise him?" "I suspected as much," Quayam says. "The guy with the gold paint." They walk in silence for a while. "It's a good thing he tried it," Thristen says. "Had to establish a basis for further negotiations." "I agree wholeheartedly," Rackhammer says. "But I'll let you speak for yourself in the council. Someone will be there from Dag to complain. A rather lovely woman, actually, a second cousin of mine. Her name is Cloudwing." New session: Kirk, Chris, Kevan, Norfolk Road, 27-OCT-17. Game date 27th October 2486. Gutak City. It is the morning of the Council of Alliances. Thristen and Gashley are sitting in the ambassador's parlor with pencil and paper, preparing for the council. Thristen goes over the calculation he and Richard Crockford performed to estimate how far the Neurothi army could travel if they are supplied only by the grain they can carry on their backs and in a cart. Assuming one cart and horse per ten soldiers, 500 kg of grain on the cart, the horse eating 15 kg/day and each soldier 1 kg/day, the cart will supply them for 20 days. After that they eat the horse and live for 3 days. After that they go for another 20 days eating the grain they carry on their backs. "Making 43 days in all," Gashley says. "That sounds about right." "And then we figure they can spend ten days foraging," Thristen says, "to obtain twenty days of food, allowing them another 10 days of marching." "I would allow them twenty kilometers a day," Gashley says, "assuming they are unopposed and they are are able to spread out across the countryside and not get in one another's way." "In which case," Thristen says, "They march for 53 days, going 1060 km, and spend 10 days stealing food." They examine their map. "If we assume they start off fully-supplied from Dragut's current camp," Thristen says, "it's about 600 km to Gutak, passing through Dag on the way. Or 700 km to Mokul, but beyond that their 1060 km does not quite get them to Gadz or Garaz." "They would find plenty of food in Varay," Gashley says, "But also a well-trained army of two hundred thousand soldiers ready to oppose them in the pass betwen the Iron Mountains and the Old Hills." "If they go through Mokul, they might sieze Mokul's grain store," Thristen says. "Bladebreaker tells me Gutak tries to keep a one-year supply of grain in its stores. Mokul has a population of twenty thousand orcs, who eat the equivalent of 2 kg of grain a day, so that would be, let me see..." A minute passes while Thristen calculates with pencil and paper and Gashley looks over his shoulder with a cup of tea in his hand. "Around fifeen million kilograms of grain." "Assuming the Neurothi army is half a million men," Gashley says, "That's thirty day's food for them. Another six hundred kilometers of marching." Thristen puts down his pencil. "So they could make it to Gadz." "Indeed. We must suggest that Mokul removes or destroys its grain store. And Dag too, for that matter." "According to Zak, an orc can carry 40 kg all day long. Even if all twenty thousand of Mokul's inhabitants carry 40 kg each, they will be able to move only 800,000 kg, which is roughly 5% of the total. They will have to destroy what's left." "But they have ogres," Gashley says. "Ogres can carry a lot." Thristen nods. "Bladebreaker says they can carry their body weight. And they weigh 300 kg." "Incredible. That's like a soldier carrying 70 kg. How many ogres does Mokul have?" "I don't know," Thristen says, "But Gutak has a population of 50,000 and Bladebreaker has about two thousand ogres to deploy in the summer campaign." "Maybe Mokul has around 800," Gashley says. "And they would carry 240,000 kg of grain. Still not enough." "No. Any orc nation in the path of the army has to destroy its grain store before its people retreat." Quayam joins them. They explain their conclusion. "We could gate the grain off Clarus for sale on Olympia. The gods buy grain from Clarus all the time. It's one of the ways they make money out of their temple plots. I don't know what price we would get, but whatever it is, we could use the money to summon grain later. Even if we get only ten percent return on the trade, it's better than destroying the stores." "Why can't a wizard make a gate to transport the grain to another location in the Outlands?" Gashley says. "Wizards can't do that, and it's against the laws of the Gods to do it for us," Thristen says. "But we know someone who could do it," Quayam says. He is thinking of Fabio Publius, but does not want to mention Fabio's name in front of Gashley Virage, the Varayan Ambassador. "Someone who can do it and is willing to break the law? Like Aries?" Gashley says. "No, not Aries," Thristen says, when he understands what Quayam is thinking. "And it's a secret. But it's something to think about." Gashley waits to see if they will say more, but they don't. "Okay. That sounds promising. And what about this Talisman of Summoning that you belive Dragut has in his possession? How much food can he obtain with the aid of the Talisman?" "That depends on how much money he has," Quayam says. "We assume he has the support of the Celtic Pantheon that owns the plots of Neuroth. Our best guess is that the Celtic Panthon is going to sell off five hundred population blocks when it gets rid of half a million people. According to our sources, the blocks are currently selling for twenty million Olympian dollars each." "The pantheon stands to make ten billion dollars," Thristen says. "If they invest 10%, that's one billion." "How much food does that buy them?" Gashley says. "My pantheon provides summoned rations for $100/day in bulk," Thristen says, "So one billion gets Dragut twenty days food for his army of half a million men." "Increasing his range by 400 km," Gashley says. "Making 1460 km in all," Thristen says, "At one cart per ten soldiers, ten days foraging, and a billion dollars of summoning." "They could get all the way to Pakesh," Gashley says. "Exactly," Quayam says. "Ursia and Varay are both at risk. They must join the orcs against Dragut's army. It's the only rational thing for them to do." "Maybe so," Gashley says, and laughs. "We shall see." From the Diary of Gristel Virage, 28th October 2486, Gutak City The Council of Alliances took place last night in the Hall of Congregation in Gutak's Royal Court. The hall is forty meters in diameter and stands alone in the center of a level space a hundred meters in diameter and paved with flat-topped stones. It was getting dark when we arrived. And it was chilly outside, with no fire in the hall, so we dressed warmly. I wore my flying kit. Six wyverns and three hippogriffs sat on the pavement. Two of the hippogriffs were teathered together. Their riders were already inside. We walked across the pavement to the hall. A circular granite wall, four meters high, supports the rim of a gently-domed roof of wood beams covered by slate shingles. The roof is further supported within the hall by a sixteen wooden columns ten meters from the center. The wall is pierced by four arched entrances facing north, south, east, and west. The floor within is the same paved stone as outside. Distributed about the floor of the hall are a dozen stone pedestals, each a meter high. Anyone who wishes to speak at the council is expected to stand upon a pedestal so that they may be seen and heard by all present. This paved space, and the hall at the center, are a prominent feature of the court. The Hall of Alliances is for meetings in which all present are to be treated as equals. Daybreak does not hold court in this hall, but rather in the Throne Hall, where she is the ultimate authority on who shall speak, and for how long, and it is she who delivers judgment. In the Hall of Alliances, her only advantage is that she chooses who is invited to the meetings and who is not. This evening, we were invited. But Sid was not, so we left him in our rooms. Orcs tend to get up around noon, work outside until sunset, and socialize or hunt at night. So this meeting was beginning at the earliest hour their habits would allow. In the past, the hall would have been lit by a few torches, but only a few: orcs see well in dim light. But now it is lit by six, dim, long-lasting luminous stones mounted upon the roof beams, one of many gifts to Daybreak from Bolus, the Ursian Ambassador. There were around twenty karazi in the hall, and a like number of keshi. It took me a while to figure out who was who. The light was dim, everyone was bundled up in coats, and I am not particularly good at distinguishing one karazi face from another in dim light. But two people stood out right away: a demon and a calipanti. Both of these individuals are what are referred to as "landholders". Elenor the succubus is a landholder. Her territory is ten kilometers across. These two landholders came from Gelden. All the land south of the High Road of Taerin, and the holy land of Gelden itself, is part of Dag. The landholders in Dag's territory appear to lease their land from Dag's monarch. So far as I can tell, all of Gelden, except for the sites that are holy to the karazi, and the immediate neighborhood of the roads, is leased to landholders. The same goes for the land south of the High Road of Taerin. The landholders are not supposed to trespass on one another's property, nor to harrass travelers on the roads. I assume there is some limit to the number of people they can have living with them on their land. I am told that their land is mostly wild. But they rule their holdings like princes of tiny states. The demon was human in appearance, about my height, but with no obvious gender. Its skin was brown. It wore a monacle over one eye, held firmly in place with a strap. Of those present, it alone was not dressed for the cold. It wore only a silk shirt and trousers. It carries a bag with a shoulder strap and a carved metal tube in one hand. It later gave its name as Zeleznicram, or something like that. The calipanti was half man, half monkey, with a long tail. If he were to stand straight up, he would be no higher than my shoulder. But he was always crouched or bent double. His coat and trousers were brightly colored. His gloves were black leather, with several rings over them. The fur on his face was whit, black, and orange. I'm calling him a man, but I'm not sure about that. His name, so far as I could make out, is Regarell. In his hand he carried a gold wand. The council went on until midnight. We were standing in the hall for six hours. I repeated my vow to buy hot stones next time we are in Pakesh. All I need is flat disks of cegotun stone, and Bolus can enchant them for me. He has been doing more and more enchanting here in Gutak City, I think because everything he makes is so greatly marveled at and appreciated here. Keshi brought hot tea to us every half an hour. Orc tea varies from one nation to the next. Here in Gutak, their favorite is fermented mint and stinging nettle. It's quite tasty and fragment, but has no caffein. I stood with Quayam, Thristen, and Zak. We stood close together for warmth. My father stood nearby with Bolus. I expected Daybreak to be the arbitrator of the meeting, the person who tells people to shut up when the talk too much. But it was another karazi from Gutak called Stonecrusher. "That's Queen Daybreak's husband," Zak said, "They don't live together any more. I don't know the full story. But I think I'll get it soon. The Gash-Man has been playing counters with him twice a week." "I have never met him," Quayam said. And nor had I. He is tall, even for a karazi, and slender. He wore a white fur robe and cap. His skin is dark gray. He stands very straight. He spoke many times during the meeting, but never for more than a minute. I was never sure what his position was on any subject. Nevertheless, looking back, it seems to me that he did a good job keeping the discussion moving, and we did reach a conclusion of sorts, in the end. Instead of attempting to record the meeting, I'll list the most prominent people to speak, and what they said. Quayam Srae: Stood up on a pedestal and recounted our trip to Neuroth, our conversations with Neurothi who plan to embark upon the crusade, and our meeting and conversation with General Dragut in his camp. His purpose was to present our evidence for the invasion in the spring. Stonecrusher asked how far the invading army could penetrate into the Outlands before it starved, and Quayam was able to convey the spirit of our calculations of range and supplies, concluding that the army could go a long way if it captured grain stores and even without those stores, could reach Gadz or Ankle. Xanthus, King of Dag: Was accompanied by Cloudwing. We exchanged respectful nods and well-wishes when we found ourselves nearby. Xanthus described how, with thirty karazi available to him, he maintains control over a hundred landholders to the north and east of his capital. Ten karazi manage the communes of the keshi. Ten more, including himself, constitute the Dag Air Force. And ten constitute the administration of the court. Of these ten, five are Travelling Judges, whose job it is to adjudicate between landholders, collect taxes, and negotiate with Dag's neighbors. These judges tend to spend their nights with their wyverns in the dozen forts Dag has build along its borders, each manned with a hundred orcs. The upshot of all this travelling up and down the High Road is that Xanthus has heard of the invasion from many sources, and has no doubt of its arrival next spring. He has no doubt that all landholders in the path of the invasion must evacuate, and his own court and people will have to flee. His plan, in the absence of any cooperation from the other orc nations, is to flee into Gelden and trust to the protection of its mountains, and the power of the landholders and his troops, to keep his people save within. Stonecrusher asked many questions, which Xanthus answered well, although he became irritated with Stonecrusher a few times. Trackandslay, King of Mokul: Stated that he wanted to make a plan for dealing with the invasion, and accepted that his nation could not be defended. Carnus, General of Garaz: Scholastican the king did not come himself, but sent Carnus, who was attended by two seasoned male keshi with close-fitting, studded leather armor and metal maces. Carnus argued that the invasion could not reach the court of Garaz, and so was no threat to his people, who could withdraw easily to the western borders of their country. So long as Mokul, Dag, and Gutak did not allow their grain stores to be captured, flanking night-time actions by the Garaz army would be able to slow down the invading army until it was forced to stop for lack of food. "This invasion is a great threat to you, my cousins, not to us. But we honor our ties with you. We will consider fighting with you to protect your lands. And we will give sanctuary to your people if you wish to bring them west." Rockorso, General of Gadz: Stated that he will bring his army to fight against the invaders if some kind of alliance could be put together with a chance of succeeding against so great an invading force. Neoprene, Traveller: This young orc woman asked permission to speak and was granted. She argued that the Outlands were so vast, so sparsly inhabited, that the invading army would be able to feed itself by hunting so long as it kept moving. Daybreak, Queen of Gutak: Argued that we should wait and see if the invasion does take place, set up a defence in depth from the High Road all the way back to Gutak, while withdrawing the grain supplies and population of Gutak into the River Fen swamp, the population of Dag into Gelden, and the population of Mokul to the west. Gashley, Ambassador of Varay: My father said the invading force might easily decide to come through Gutak to Varay, where they would face the Varayan army on its home soil. He doubted that the invadors would win that battle, but the devestation to his country would be unfortunate. It would be better for Varay to fight a defence in depth in friendly territory, as Daybreak proposed. Whether his countrymen will agree that Gutak and Dag qualify as friendly territory is something the Varayan parliament will have to decide. He will return to Varay to speak to parliament in the next week. Regarell, Landholder of Gelden: His voice was high-pitched. I found the sound of it irritating. Stated that he was one hundred and eighty six years old. The Neurothi have been talking about this holy war for over fifty years. The gods have pre-ordained the war, and none of the invaders intend to return home. "We landholders are each of us a power in our own right, and we can unite for this great event, and fight with you, if you will protect our estates from being ransacked by barbarians. I have worked with love and care for twenty years on my estate, and I will be loath to see it destroyed, along with the temples and holy places of your great Lord Gelden. The plan of King Xanthus will suit me well, but I see no means to bring the grain from Dag to Gelden, other than by some magical means." Here he stopped and looked at the demon for a few seconds before getting off his pedestal. Zeleznicram, Landholder of Gelden: His voice was flat and his face neutral. "I live among the karazi even though you are barbaric, violent, and often cruel. I live among you because you are honorable. Sapiens are not. Sapiens are wanton in their destruction, careless of their own lives, and impossible to predict or negotiate with. I have paid rent to you for over two centuries of this world's years. I have followed your rules. Now I demand protection for the estate that I have cultivated. I will help you in your fight, as Regarell seems to think we Landholders should. Or I will flee if you will not protect us. If I flee, I ask repayment of my rent, for that rent was given with anticipation of stability." Stonecrusher said, "Do you ask that the karazi conquer the will of the Gods in exchange for your rent?" and "Is this subjucation of divine machination so included in your contract with Dag, because if it is, then I should like to read the wording." There was some laughter at Zeleznicram's expense. The demon's face remained neutral. Bolus, Ambassador of Ursia: "We do not have armies. But we have an air force. It is much depleted after our wars with Endromis, but we could sent five hundred griffs with thunder-eggs to take control of the skies above the army. We could help with the building of temporary roads and the transportation of soldiers and supplies. For myself, I dount that this invading army could ever reach Pakesh. But we want our allies to be strong, and we have an alliance with Varay. So it could be in our best interests to support you. But first we need to see you come up with a plan of battle and some kind of coordinated leadership." Rackhammer, General of Gutak: "I do not like the idea of fleeing into a swamp. I do not like mosquitos. They love me, but the love is not returned. I would rather not flee into the swamp. With sapiens invading our land, they are violating the Treaty of Reconcilliation. I propose that invade them in return." There was murmering of interest at this point. Stonecrusher was smiling up at Rackhammer. Zak whispered in my ear, "Rumor has it that Daybreak fell in love with Rackhammer, and that's why Stoney left her. Rack and princess had a fling, they say." I scoffed. "I don't believe it, what nonsense." Rackhammer continued. "Let us go north, gather our neighbors in Mokul and Dag, march through the sapien nation of Morden, and take for ourselves the land of Vostok." He holds up a book. "I have read about it. A land inhabited by a creatures who are half sapien and half wolf. They are called werewolves. They are greately feared by sapiens, and Vostok is deserted apart from these creatures. We can go there into the mountains, and we will be far from this holy crusade. The crusadors will not turn north into the mountains to persue us. They will continue west to Garaz, or continue south into Varay. We will be unharmed." Many people started talking at once. Stonecrusher let them continue for a few minutes, then silenced them and said, "General, does this plan not seem to you a little uncharitable towards our cousins in Garaz?" To which Rackhammer answered that he had not thought of it in that light, but that perhaps Stonecrusher had a point. Stonecrusher said, "How do you know that this book of yours, excellent though it may be, is sufficiently accurate to entrust the wellbeing of our people?" They soon concluded that someone had to go and take a look at Vostok. Quayam volunteered, and Thristen and I with him. Stonecrusher said, "You three are useful allies. And you are friends of the dragons, if the stories I hear are true. Have you spoken to the dragons about an alliance between orcs and dragons? Perhaps there is some value in our alliance. Who kows?" Quayam said that the next time he saw a dragon he would bring the matter up. The conclusion of the council was that half a million sapiens bent the destruction of orcs, wizards, and ultimately themselves, will invade north of the High Road in the spring. The army generals agreed that the army must first be confronted near the High Road, with a defence in depth to follow. But the generals doubted that Gelden would be the target of the invasion. Another council will be held within a month. 29th October: Last night we met in the Royal Court to hear Cloudwing's complaint about our failure to permit ourselves to be taken into custody while flying over Dag. I argued that it was more of an attempt to kill us. Rackhammer agreed to give us letters of transit for the future, so that the Dag patrols would allow us to go about our business, such as flying to Vostok. Today we flew to the Green Horn Tavern and talked to Falmut. We have Sid with us. Falmut spent some time in Vostok only ten years ago. He went in search of the cool-sounding Tombs of Gralmaze and made an alliance with four werewolves. "They fight light crazy, those creatures, and heal fast. Don't think you can just march in there with a bunch of orcs and take over. But you can reasone with werewolves. They are not crazy. But they sure are ugly." We talked to Op-Inc about werewolves, hoping to get a clearer picture of what they are. Turns out they are pretty interesting: original soldiers of the princes of hell. TOHA Accounts: Including adding the Talisman to the list of assets. Adventure Idea: Where are the highest mountains on Clarus? Given that wyverns can't carry a person above 4,000 m or so, no matter how light, an adventure at 5,000 m would be interesting. Adventure Idea: go to planet XV to study the conjunction XVXV1, which occurs every 172 Cdays and connects two points on XV separated by only 10.8 km. Guard wizards while they set up a system of light beams to measure the time shift of the conjunction, and to see if a conjunction could be used, in theory, to send a beam of light back into the past. Required Equipment: Hot stones to keep you warm when flying in winter. Compose: What is the town on the High Road of Taerin, where another road goes north to Anplery? That town is half-way between Kent and the Roden Mountains. The trip to the Roden Mountains is one thousand kilometers across mostly desert, with a few oasis towns on the way. Neuroth Invasion: An exodus of Neurothi soldiers commencing in the spring of 2487. The Neuroth population is 1.0 M. The next census is 2488. The previous one was 2474. The population of Clarus has grown to 110 million, with population blocks for only 100 million. The plot owners with excess population are looking to buy blocks. The Celtic Pantheon has arranged to sell five hundred of its one thousand population blocks for $10B Olympian dollars, or $20M each. In the past few centuries, one block has been worth around $10M. When managed conservatively, a Claran population block earns $100k/yr, or $100 per person. At a purchase price of $10M, the return on investment is 1% per year. Over-count fines wipe out 100 years of such profit in 10 years. But Clarus has been yielding good profits over the past few decades, so that many pantheons are making $200/person. The value of blocks has doubled. The Neuroth panthon is orchestrating an exodus of as many men, women, and children as can be persuaded to join in, to sweep across the outlands to their own destruction. Neurothi Crusaders: The Neurothi exodus is a Holy Crusade to cleanse the Sapien Homelands (the Outlands, where Mareo used to be) of hellspawn, re-claim the Holy Lands of the Encircling Mountains (Gelden) from the Demons of Hell, steal the vast piles of treasure they believe demons and hellspawn are hoarding, and set out into the desert to sack Pakesh and raze it to the ground so as to wipe out the scourge of sorcery. On the way to Pakesh, they may or may not rampage through Varay, which is a nation contaminated by the blood of hellspawn and needs to be shown how pure-blooded sapiens make war. Celtic Pantheon: So far as the Celtic Pantheon is concerned, their intention is for the crusaders keep going, having a great time, until they are all dead, while doing damage only to the holders of the Outland, Varayan, and Ursian temple plots, none of whom are buyers of the Neuroth population blocks. With effective persuasion, the Celtic pantheon is betting on getting at least half their population to join the crusade, so that will be 500k people, including men, women and children. General Dragut: Dragut makes sure the Great Army has an air force of 10 wyverns and 100 griffs, delivered from Olympia and paid for by the Celtic Pantheon. But he knows that this mission is doomed, and that almost everyone embarking upon it will die. Dragut's generals are 10-20th level fighters, see Adventurer Level Distribution in Neuroth. Of the one hundred or so 20-40th level fighters native to Neuroth, only one in five will agree to embark upon this crusade, and they form his personal guard, which he uses to direct special operations and the air force. Their loyalty to the cause varies from passionate to mercenary, but they respect Dragut and trust that this adventure will at least be profitable. The median age of Neuroth is 13 and the average age is 21, see Population Distribution in Neuroth. Those 13 and under are 0-level fighters with no dodging points, those 14 and over are 1st level or higher. The distribution of ages in the army will be: 100k children, 400k soldiers. Perhaps 80% infantry, 10% cavalry, 10% archers. Allies of the Crusaders: The crusade will be joined by 100k male and female soldiers from Grototh, 50% cavalry, 50% infantry, whose pantheon is selling population blocks also. The crusade will be joined by many other smaller groups from the surrounding nations, for their own reasons, such as The Brotherhood of Light. The Crusade is being discussed and decided upon now, in Neuroth, Grototh, and Kent. Defense of Outlands: The invasion of the Outlands threatens to wipe out the orcs and overrun and destroy the Trans Outland Highway. The orcs must unite to have any chance of surviving. They may need Varay's help. If they are defeated, Varay may be overrun as well. Or the orc armies may flee the Crusaders. There are two un-marked nations on the Mid-Western Idonius map. One of these could be a place upon which the temple plot is for sale, and QTG could buy it through Aries, making a place large enough to hold most orc survivors. First, QTG would have to go make themselves rulers of the nation, whatever that nation may be, which will be a series of adventures. 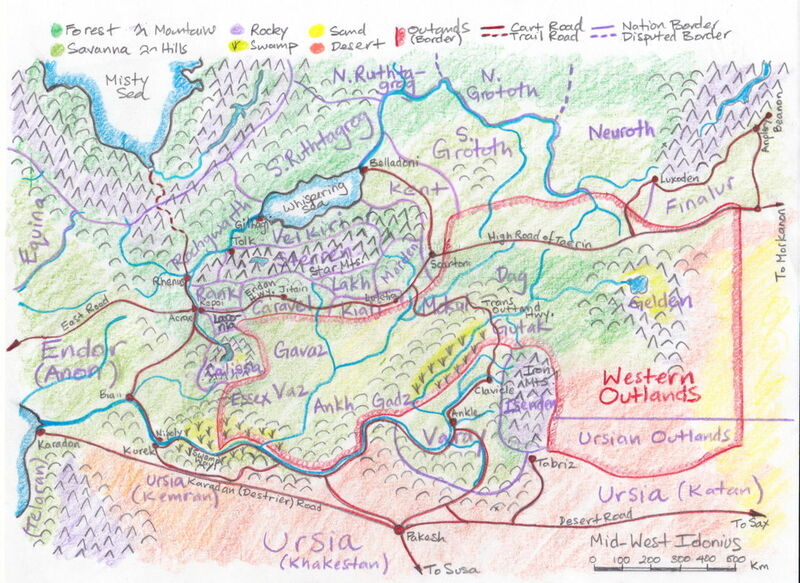 If the orcs leave the Outlands, the Reconciliation Treaty puts responsibility for the orc population outside the Outlands on the Princes of Hell, as well the population count of the crusaders, who may be in the Outlands at the time of the next census. Both such outcomes are obviously unfair, so the Reconciliation Treaty will be destabilized. It may be repealed. Quayam, Gristel, and Thristen would be right in the middle of it all. If we pre-suppose that pride prevents Garaz from taking orders from Rackhammer, there could be a pressing need to defeat Garaz in an early spring campaign, before the Crusaders arrive, or to stall the Crusaders until the orcs can be united. Thristen may find he has to go fight in the tournament in Ankh and become king of Ankh for the duration of the summer campaign of 2487, which will be a fight for survival against the Crusaders. Supplying War: One of Dragut's chief concerns is supplying his army. He believes there are sufficient resources in the Outlands to support his army if his army moves fast enough and forages on the way. He may be right. He doubts his druids will be able to summon food in the Outlands because the Princes of Hell own all the temple plots and will deny summoning to the Crusaders. But there exist, according to legend, six Talismen of Summoning that permit the holder to over-ride the temple plot owner's veto regardless of location, after reciting an incantation averring that the talisman's use is for the good of mankind. These talismen were granted to six Guardians of the Borderlands after the Reconciliation, and they are intended to permit sapiens to fight back against orc raiding if necessary. When a talisman is used, it is a matter of public record on Olympia. Dragut has one, and his Arch-Druid has used it recently. The Brotherhood of Light has one, and they use it often when working with the Kent Police on anti-slavery and anti-drug excursions. One is supposed to be in the treasury of the Queen of Caravel. Another is lost, but Rackhammer knows where it is. Another held and used by the Endan Government. Another is held by an wizard adventurer. Another is lost. The Celtic Pantheon is earning $10B from this sale, and is willing to provide up to $1B of summoned food for the Great Army. At $100/day/person that's 10M person-days worth of food, to be delivered as Dragut sees fit. For an army of 500k, that's 20 days of food. Space Ships: Space exploration is an ambition of Ursian wizards. They need better thrusters. Thristen Family: Discussed Darkeye and Grandad: Grandad is Travis's twin brother. Resolve that both are still alive. They disappeared at one point when Travis was young. Darkeye took Grandad to Domus, thinking Travis was dead after a particularly disastrous battle. Travis grew up and became one of the soldiers of the Dark Side, then escaped to Domus. Grandad is going to show up one day, and Darkeye too, looking for Thristen in his own time. Need to figure out details, but the idea is to bring both characters back into the game in such a way as to create tension over time travel and destiny, and to bring Thristen's affair with Zak to a crisis of sorts. Shabboth: Some daemons can make demons, but not particularly well. The result is shabboth in large numbers. These tend to have skulls made of 1-mm steel, and have command words in rattikit that are not recorded anywhere. They have no fear, don't last more than a few years of use, and are disposable servants for the nightmare daemons. We should introduce these into the game as the new "kill them and don't feel guilty" creature. They are machines with only primitive feelings.